Adding My Flavor of Sparkle to Everything! 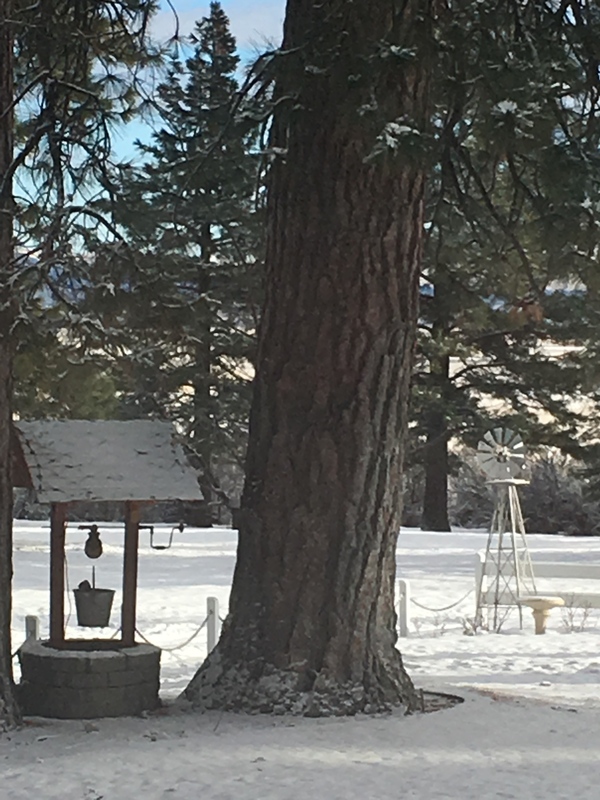 There is so much room out here on the Ranch, I am obligated to fill up all the spaces with something interesting. 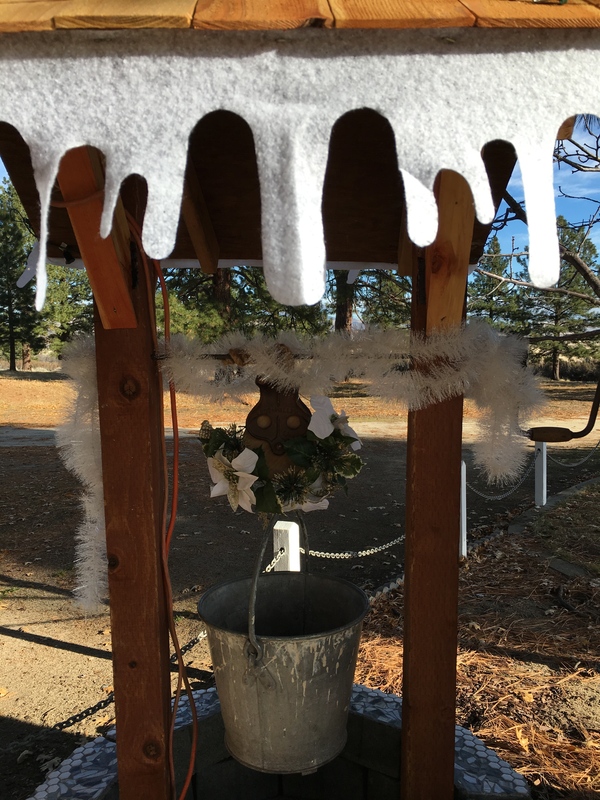 I decided I wanted a wishing well, but not just any wishing well, it needed to be big, and pretty. So the search was on for inspiration. 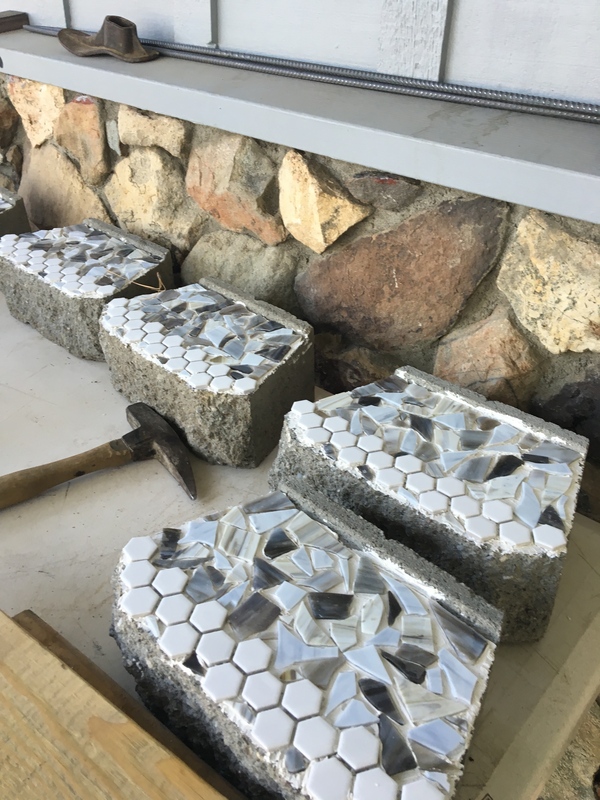 I saw a pin for a fire pit of stacked retaining wall bricks, with the tops done in a mosaic. Dirty, grey, but they were so blah…. hmmm? how to fix that? 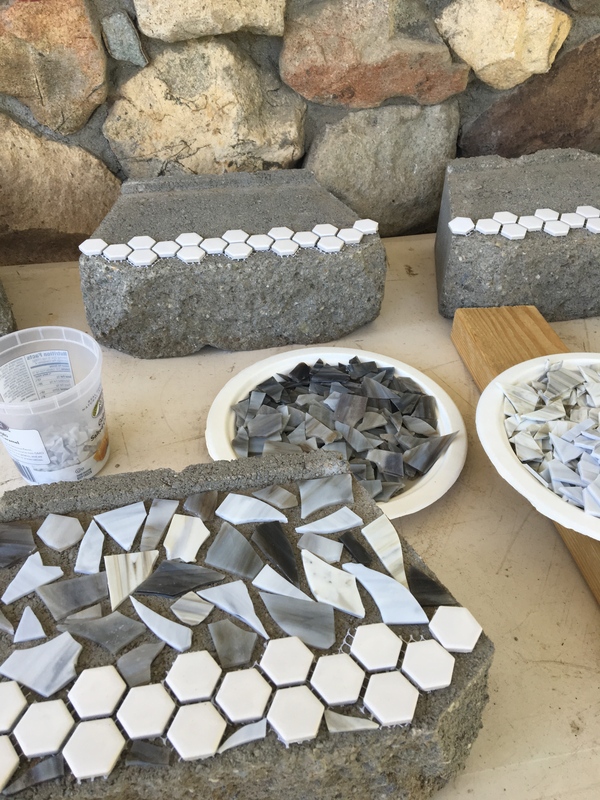 I know, lets tile them with mosaics, that way the well will be pretty and magical! Started by cleaning them with a brush and locating “pretty” stuff for them. 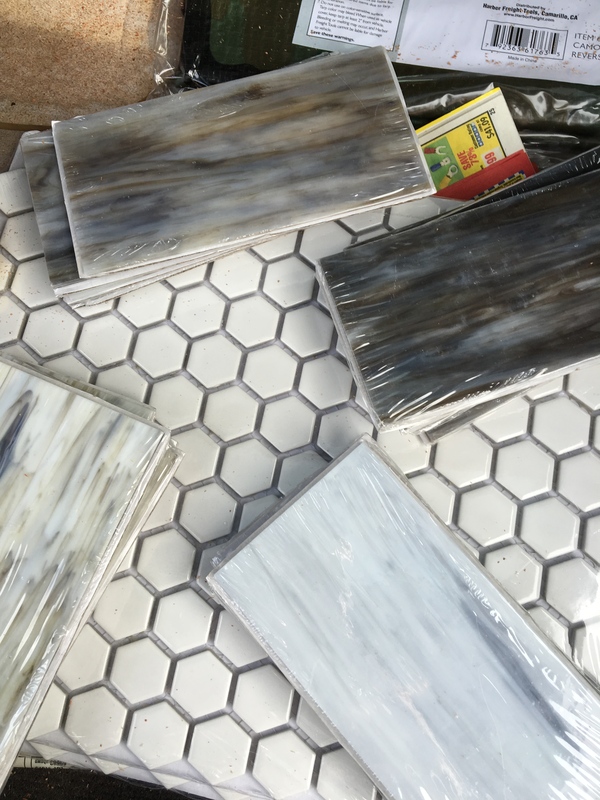 Discount glass tiles, and sparkly silver glitter grout from the clearance section at Lowes! 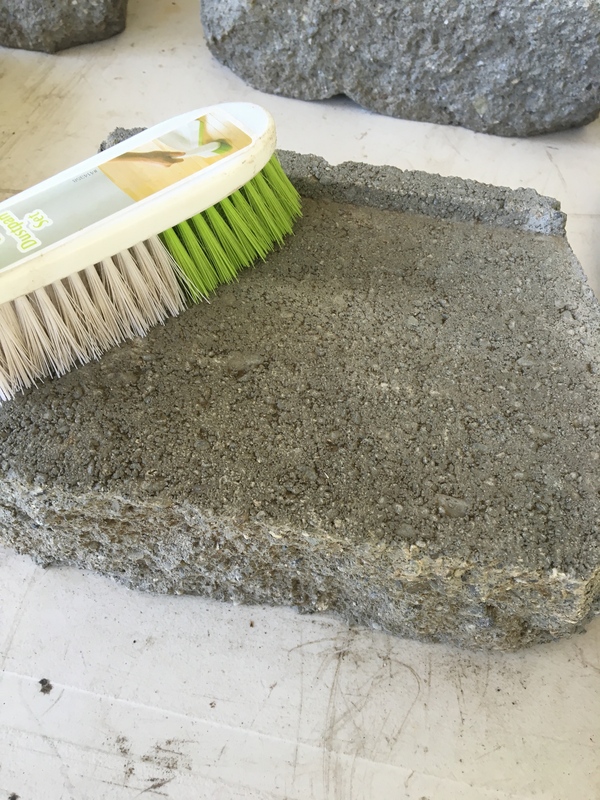 Use a towel when you break the glass tile, and lots of waterproof mastic. Gloves might have avoided cuts, but are hard to work in. I put each color into bowls and lined up the top layer of bricks so I could spread out the colors evenly. 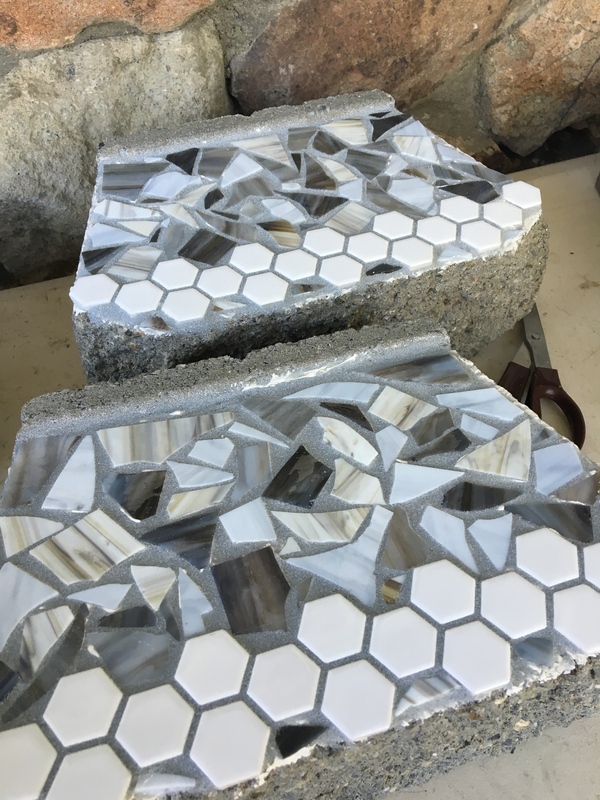 I wanted an edge on the outside of each brick, and the hexagon tiles fit perfectly 12″ across without having to cut any of them. It’s always better to lay out your pattern before you begin gluing them down. 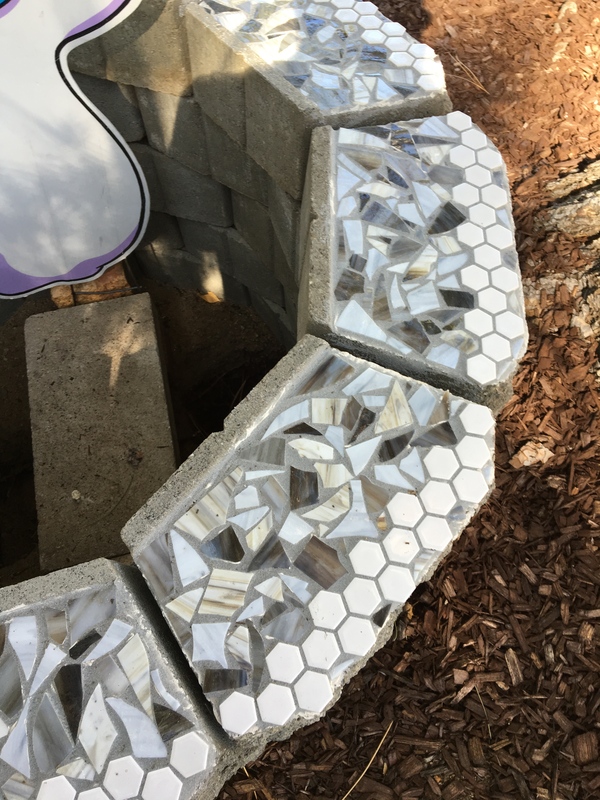 The grout plus the glass tiles make them really sparkly in the sunlight. Just simply stack the rounds of blocks and made this the last course. 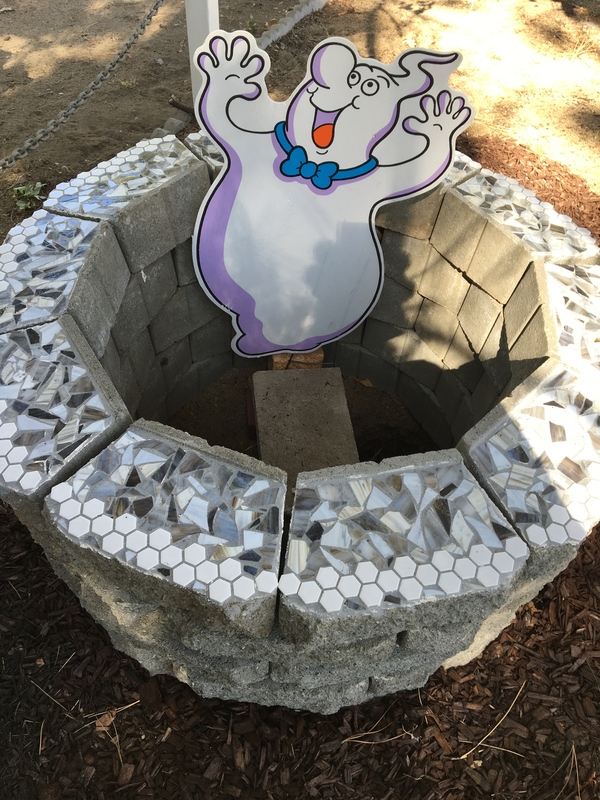 You could end it here, and make it into a fire pit, but I really wanted a wishing well. 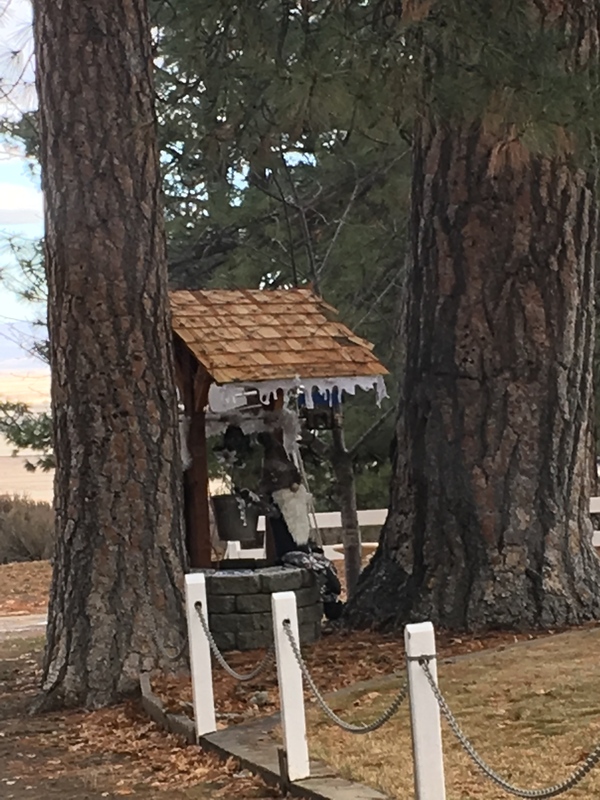 so it needs a roof. and attached each of them onto pier blocks hidden inside the circle. 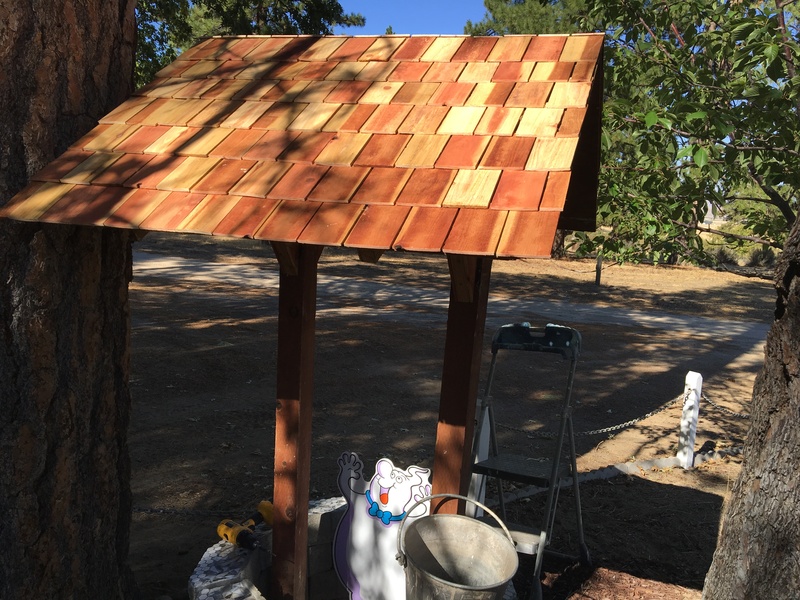 Next, we cut plywood into two 2′ x 3′ sides for the roof. Since I wanted shake shingles and live in CA where they been banned, I had to make my own. 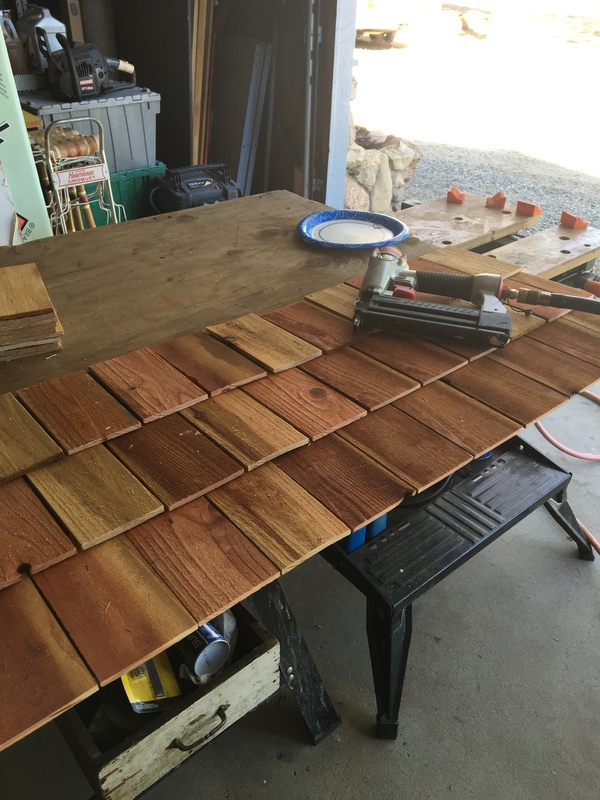 I purchased redwood bender board (super cheap) at Home Depot and cut them into 7″ shakes. got to use the air nailer (that was fun) and covered it in staggered pattern. 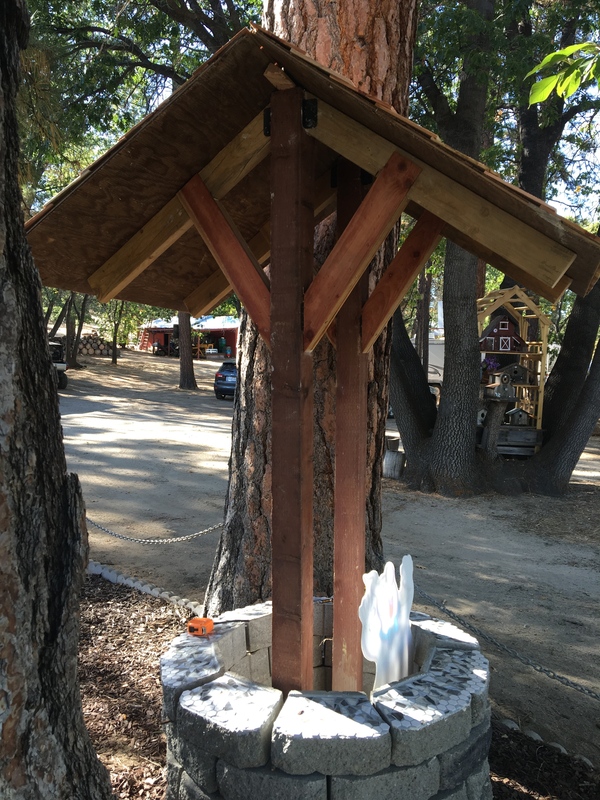 We put a piece of rebar trough the support poles and used an antique drill for the handle. and filled it with squirrel food. Love watching them swing and eat the corn and peanuts! 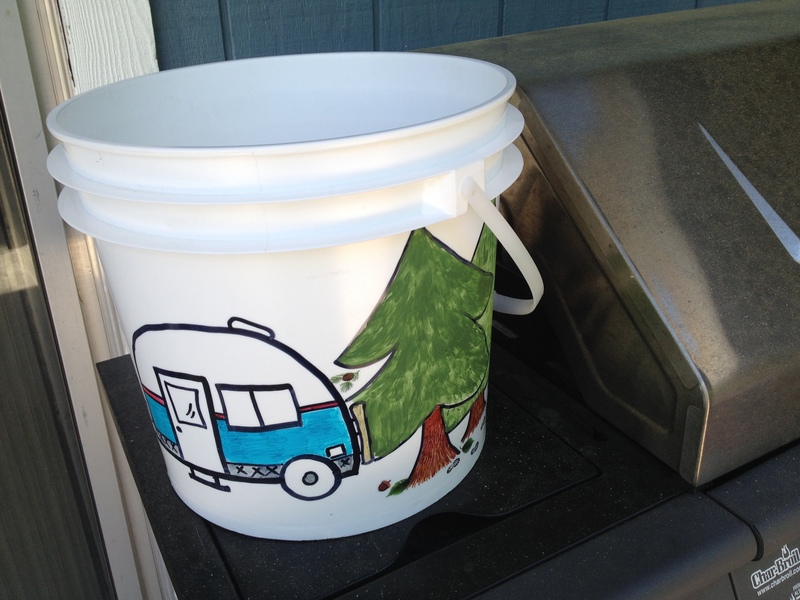 So I happened upon this funny idea for a trash bucket for my R.V. and couldn’t resist making it. 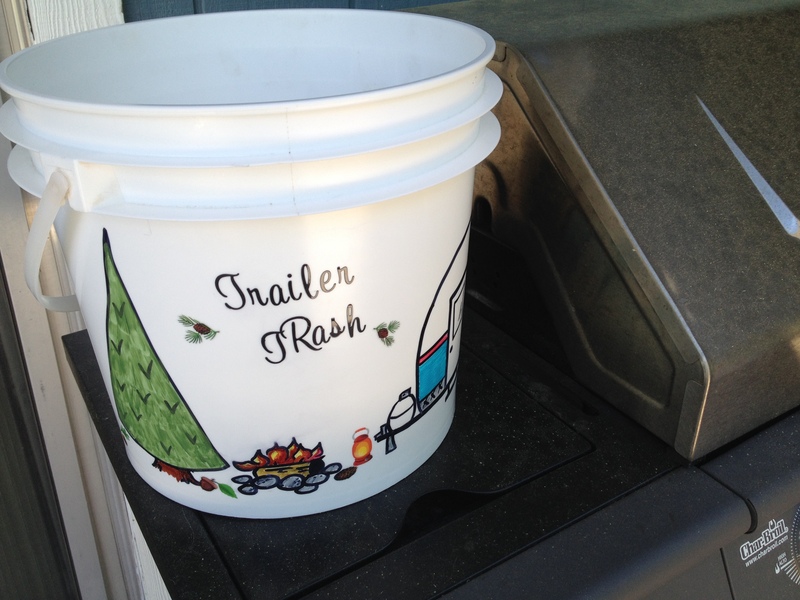 for trash, recycling and pinecones…. so why not decorate them? Right? 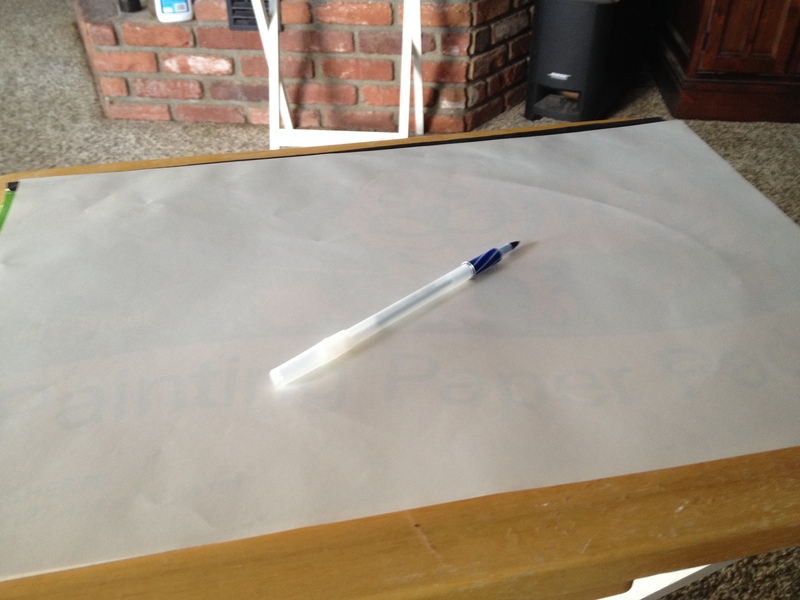 It started with a blank canvas. Sketched a few ideas. Some made it, some not…. figured out simpler lines were easier on a round surface. Used a little goo gone to remove the bakery sticker. 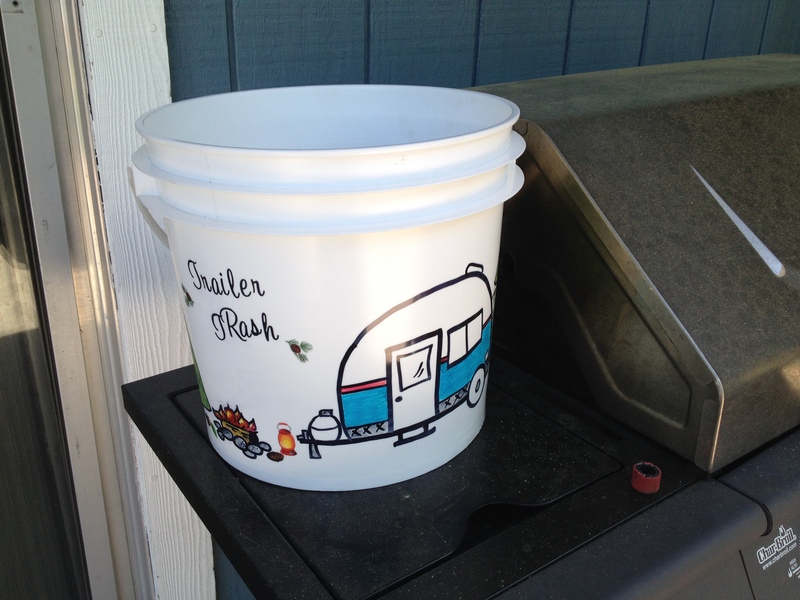 Washed the bucket inside and out. 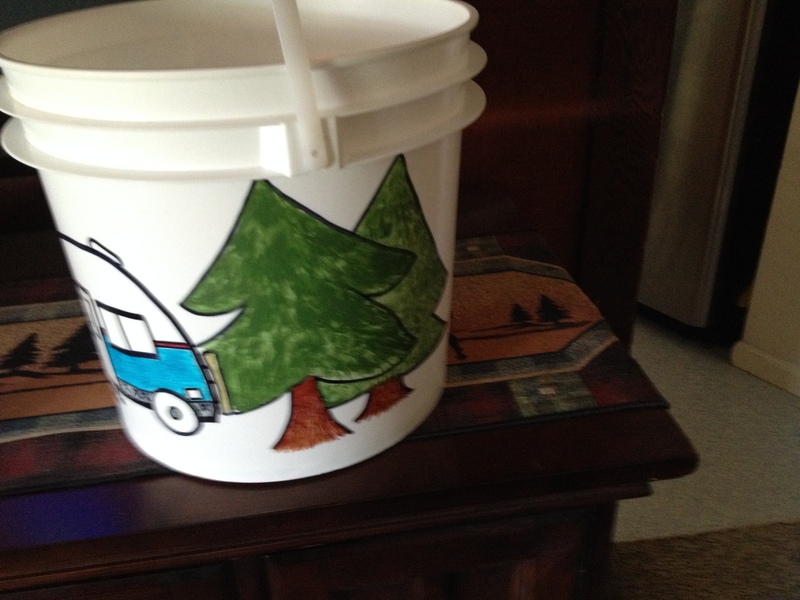 and hold it up to the light, you can trace it onto the front of the bucket with the marker. 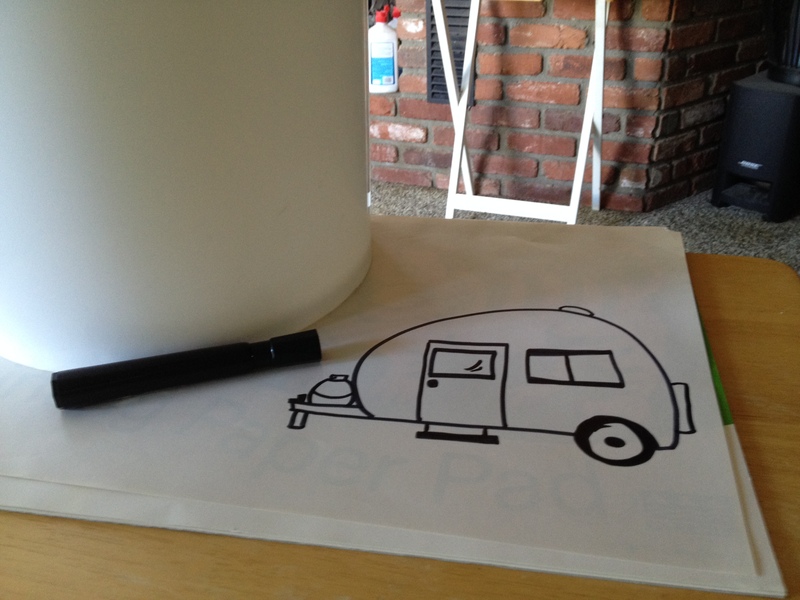 I figured out that an ink pen just wouldn’t write on this surface. Kinda like a coloring book page, put the bold lines down first, then add the details later. 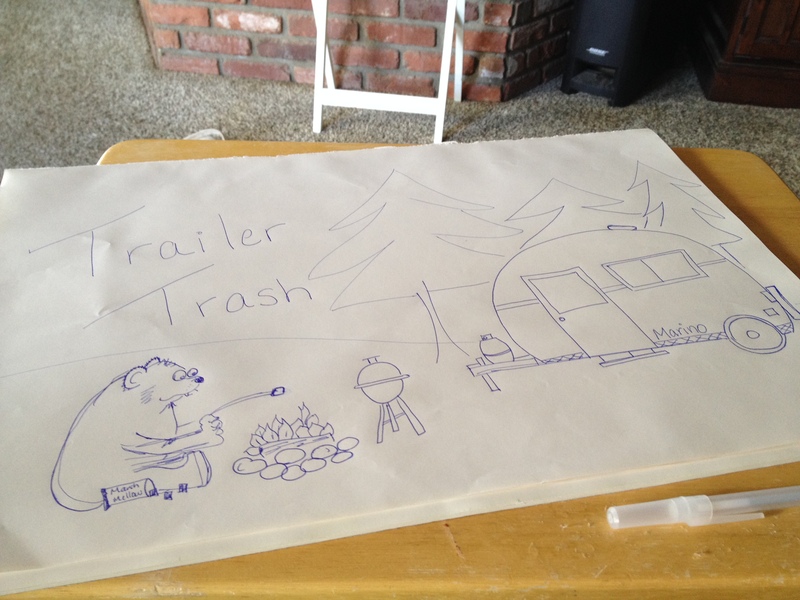 I did cheat a little bit, used scrapbook letters for the “Trailer Trash” and some tiny pinecone stickers too. 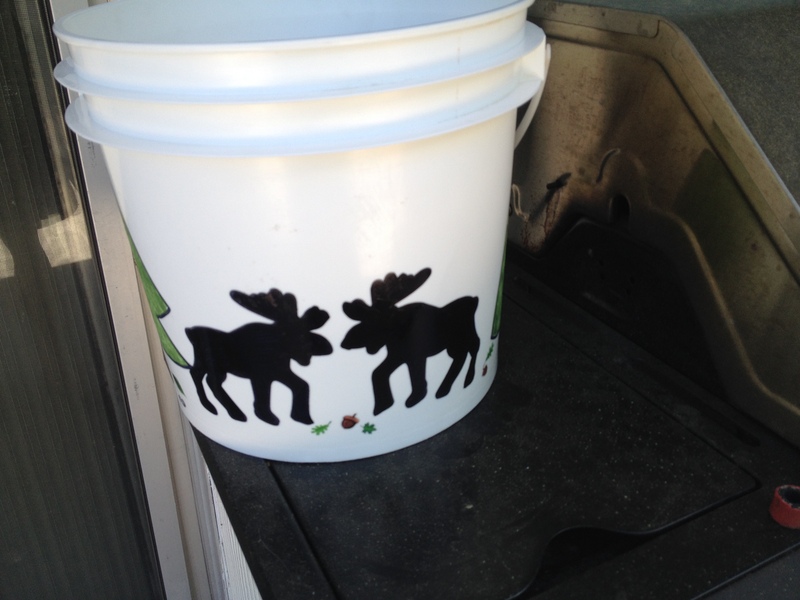 Traced a cutout of a moose kissing a moose….think I’ll add a heart between their noses. You can decorate in any style that suits your decor. The next one will have some bears on it. Well. 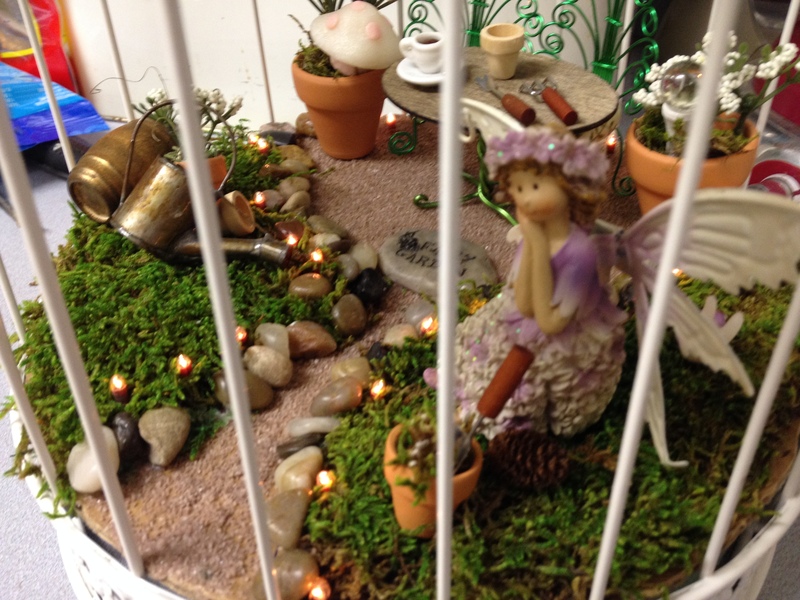 I almost hate to admit how much fun I’ve had making this miniature fairy garden. As a grown adult, playing with teeny tiny miniatures has been soooo relaxing. I started with one for the house, see previous post, and now I’ve moved outdoors. This is Giselle’s sister Genovese. She has just moved in her new place on my deck. I had an old unused half wine barrel, already lined and filled with dirt. 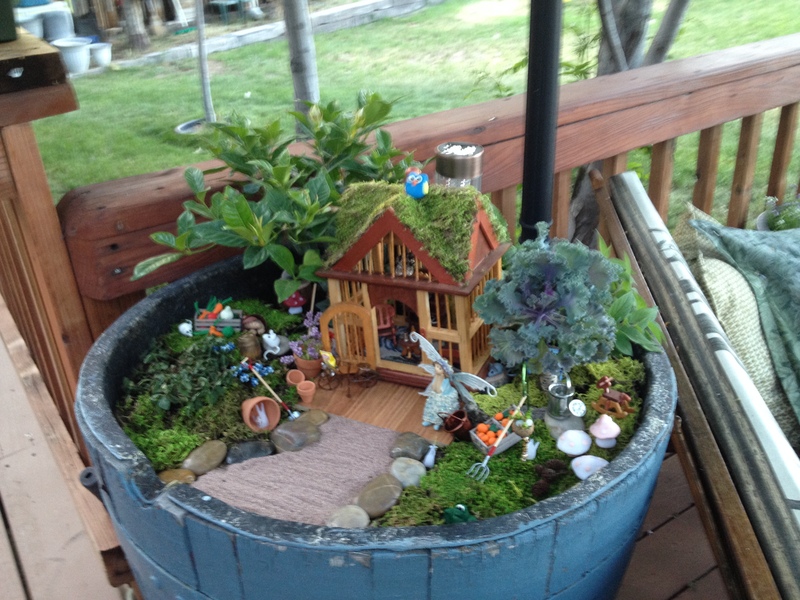 Since gardening really isn’t my calling, crafting is….so in the spirit of magic, lets take a tour! I cannot totally recall the order of things, I’ve been making and remaking items for a couple of months now. The house was the biggest part. 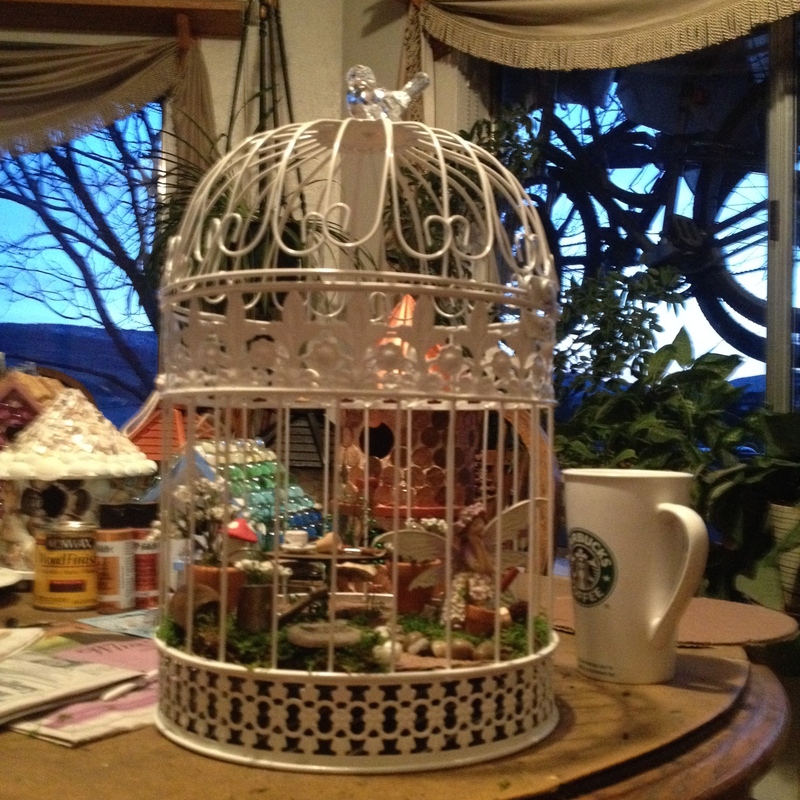 I purchased a wooden birdcage style house from the craft store. decided to paint it copper, bronze and antique gold. The roof seemed to need more “nature” so I glued sheet moss to it. And a super cute owl from a friend. Might be hard to see, but she hung a chandelier made from a fishhook from the center beam. Nearly made the kind clerk at the sporting goods store cry when I told him what I was buying it for. Added a few beads, kept the barbs exposed, and decided to lose the shiny lure in exchange for more beads. I made some super inexpensive furniture from a wooden puzzle, and stained them to match the house. 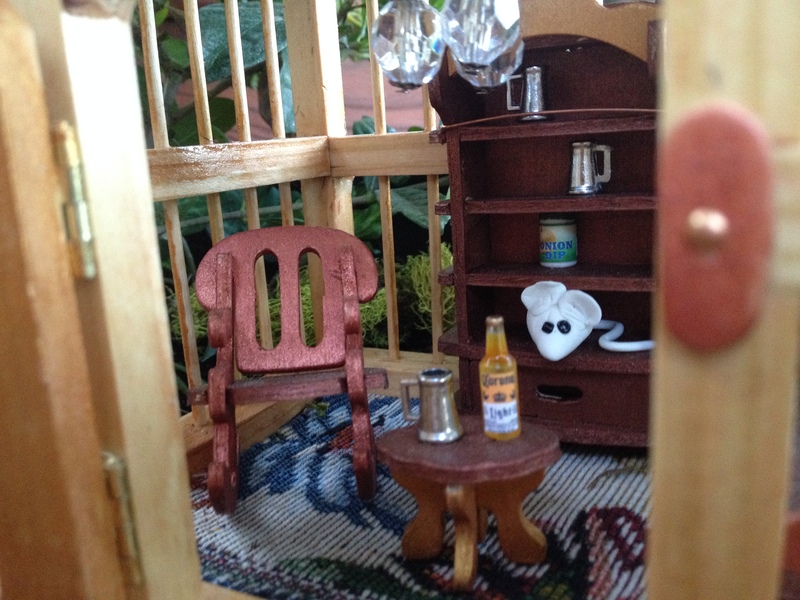 A small bed, table, rocking chair and a cabinet with open shelves. (I bought the mugs, beer, chips and dip online). 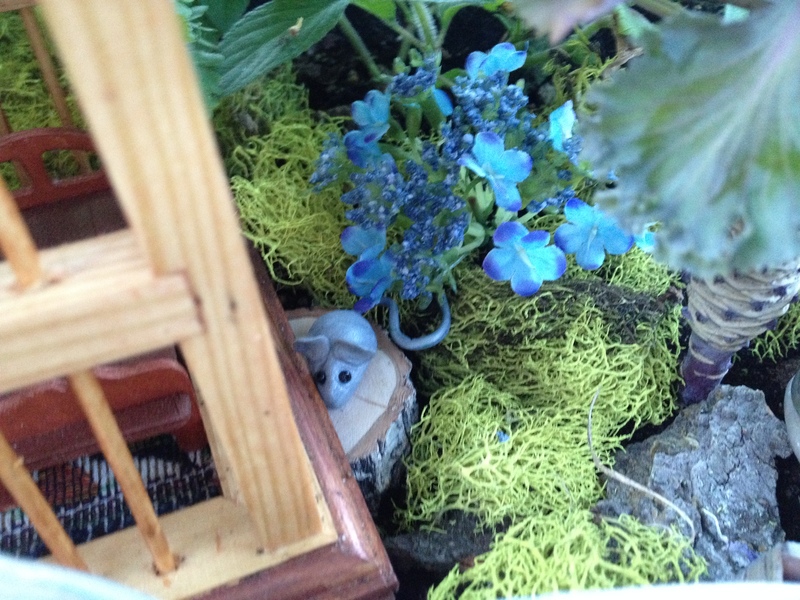 Made the mice from polymer clay (super easy) and cut a piece of tapestry fabric for a carpet. So Homey!! I’d move in, all the comforts of a cabin in the woods. I decided to raise the floor level above the dirt in the barrel because I have a mix of real plants and artificial and will need to water them and don’t want to flood her nice place. I used rounds of wood in back and sides. 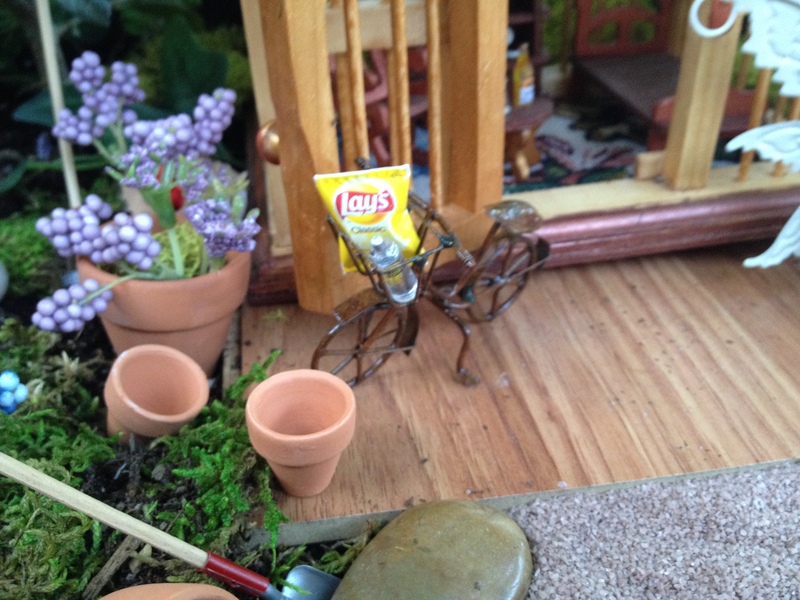 Took advantage of the area to place a mousey. 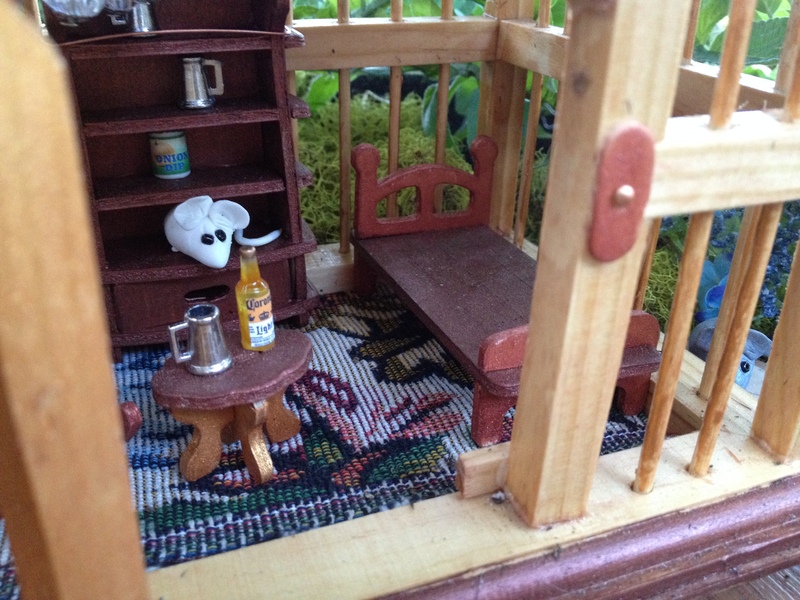 I used a sample piece of flooring to make a porch for her and her bicycle to rest on. I also serves to lift the front of the cabin as well. You can get sample pieces free, as well as carpet for your house. I did pre-plan the placement of the house first. Centered and slightly backed up in the space. I put a solar light behind her house to light it at night. Then planted the Gardenia tree, a Kale tree, and a couple low, slow growing herbs. peppermint and pineapple sage. *This was in honor of Grandma Marino, every year when we’d visit her garden she would take the kids out, crush the leaves and make them smell them. 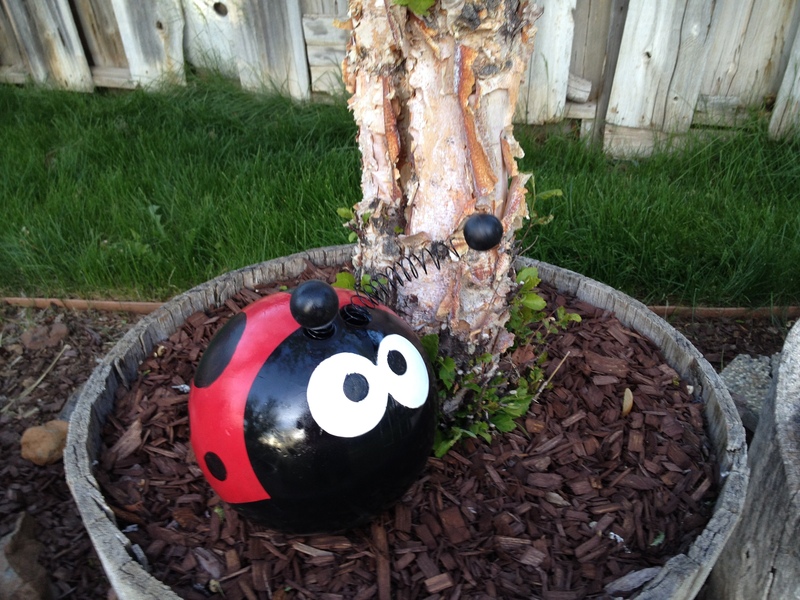 I wanted to have some items in my garden that would be interactive also. 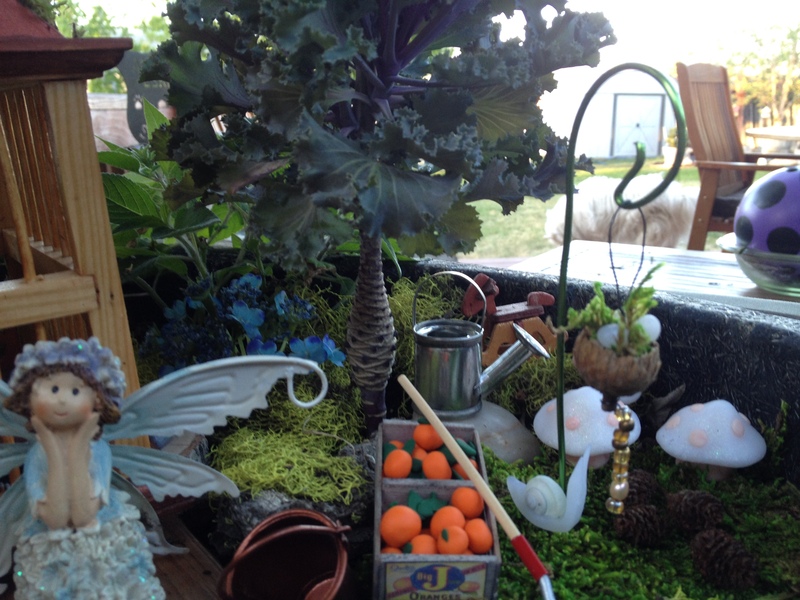 Last years kale plant, (on clearance) became this years tree for fairies! 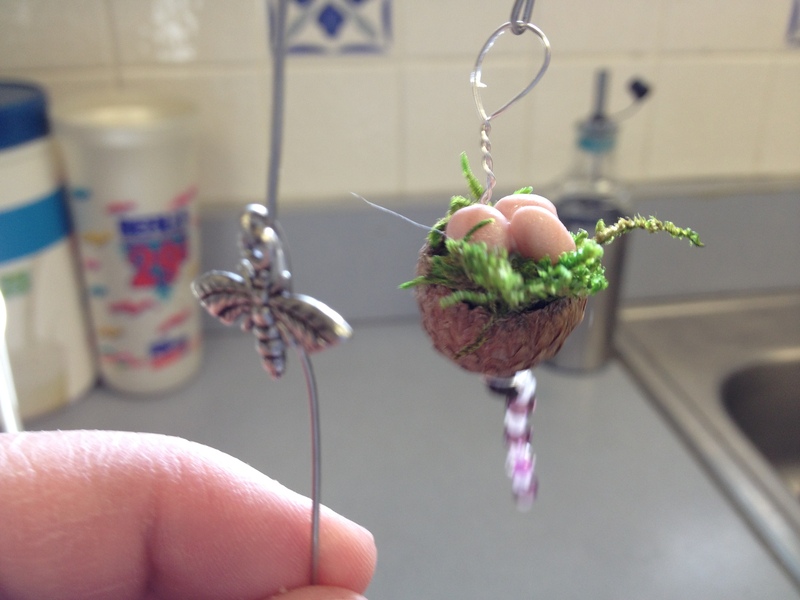 The Shepard’s hook was wire from the craft room, made a bird’s nest in an acorn cap, added some beads and polymer clay eggs. 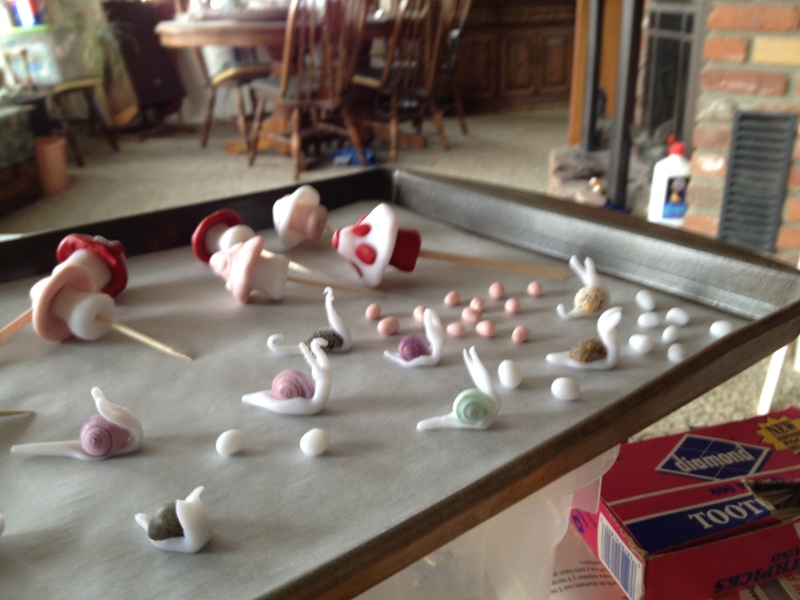 The toadstools were crafted out of polymer clay, as were the snails. 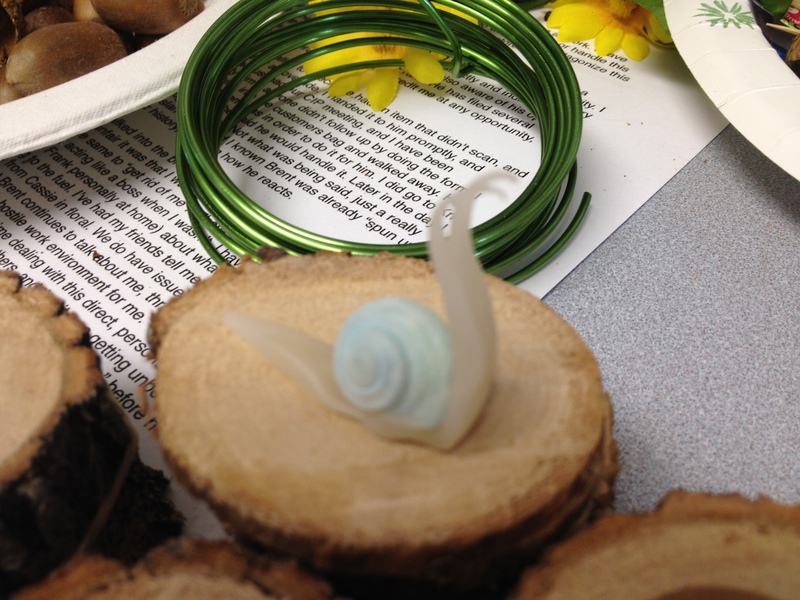 The tiny seashell came from a lake nearby and a crafty friend dyed them pretty blue and purple. 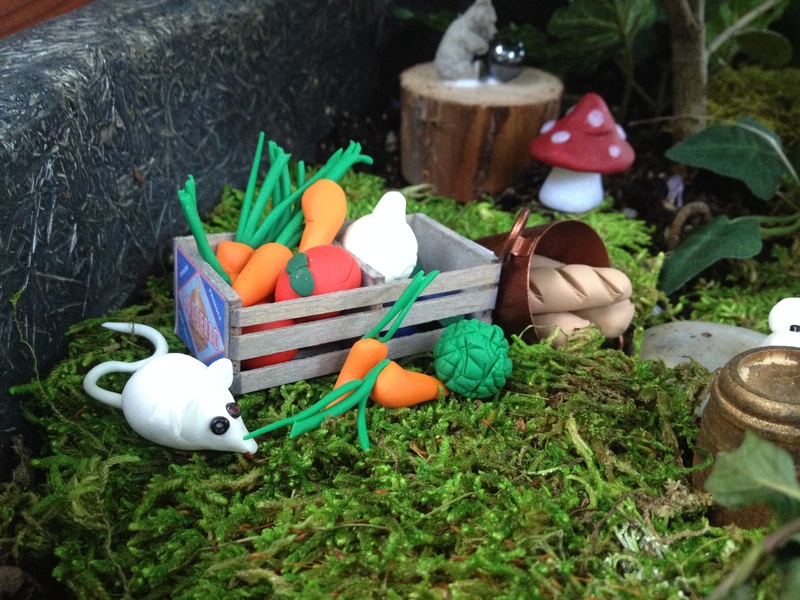 I purchased the crates online, and make the fruits and vegis from polymer clay. Tiny buckets from the craft store, filled with polymer clay loaves of bread, more clay mice (She loves all of Gods creatures) and a miniature bear with gazing ball on top of a wood round. The sheet moss is a good ground cover, if kept wet, will stay in place easily, I did tack it down with a couple of garden staples. Teeny Tiny baked pies in bottle caps cool in the shade. Garden tools made of clay and wooden dowels. Terra cotta pots planed with berries, and flowers. Sand from the dollar store, makes a nice path, with the teeny rake its a teeny zen garden to rake into swirls and lines too. 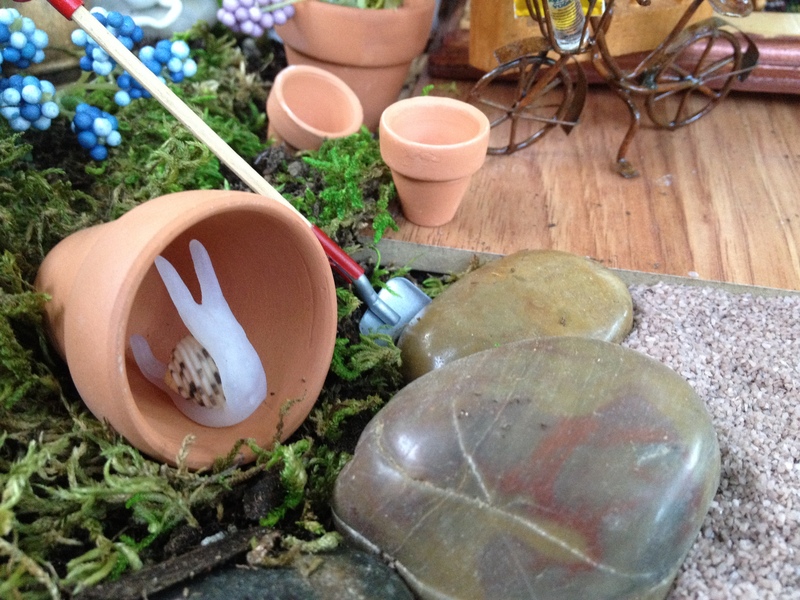 A seashell slug has hidden himself in a pot. 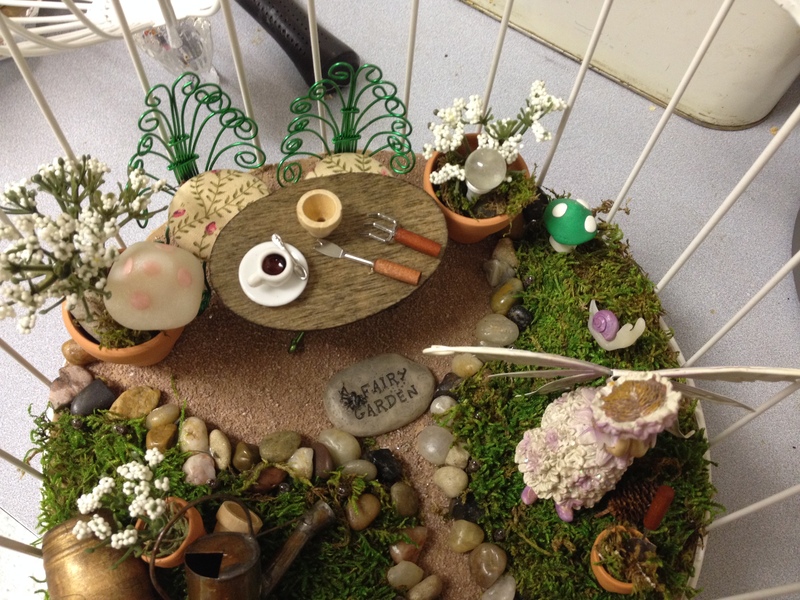 Not quite finished, there will be a pond in an abalone shell, once I mange to make it over to pick it up from my BFF. 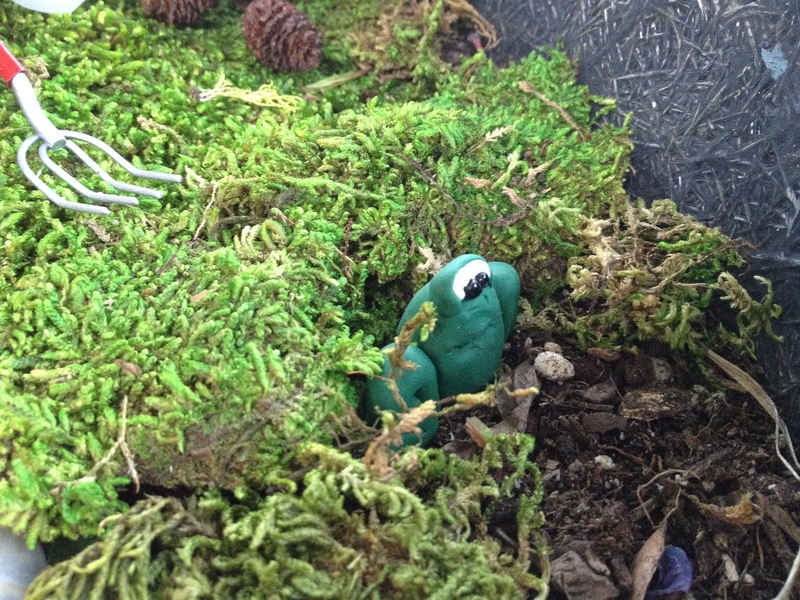 The Frog seems depressed that I haven’t get his area done yet. OK, so the conversation started, “Do you have any ‘old’ balls lying around?” followed by an uncomfortable silence. Wait! that’s not how I meant that. Let me try again, do you have any old, bowling balls? 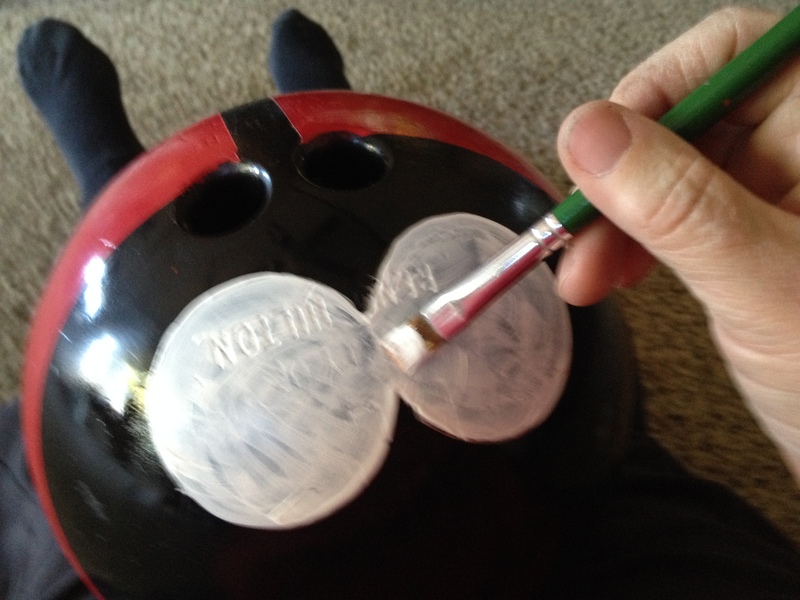 Yes, after he stopped laughing, and told me I made his day…..Mr. bowling alley gave me two cracked, unusable old balls! FOR FREE!!! Score!!! 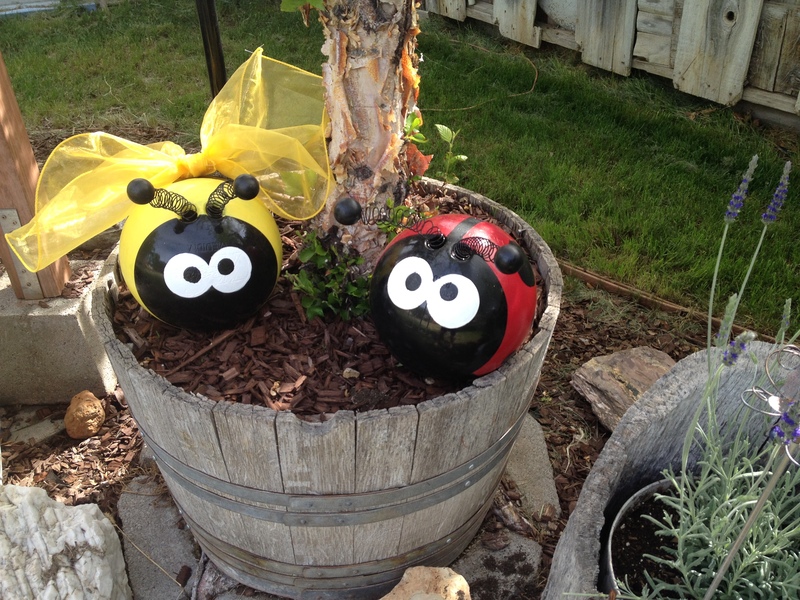 So, since we all know I spend too much time on Pinterest, I saw this idea, and these were so cute, I had to find a couple of ‘old balls’ to make my own super cute ladybugs for my garden. I ran electrical tape down the center of the ball to section it in half. 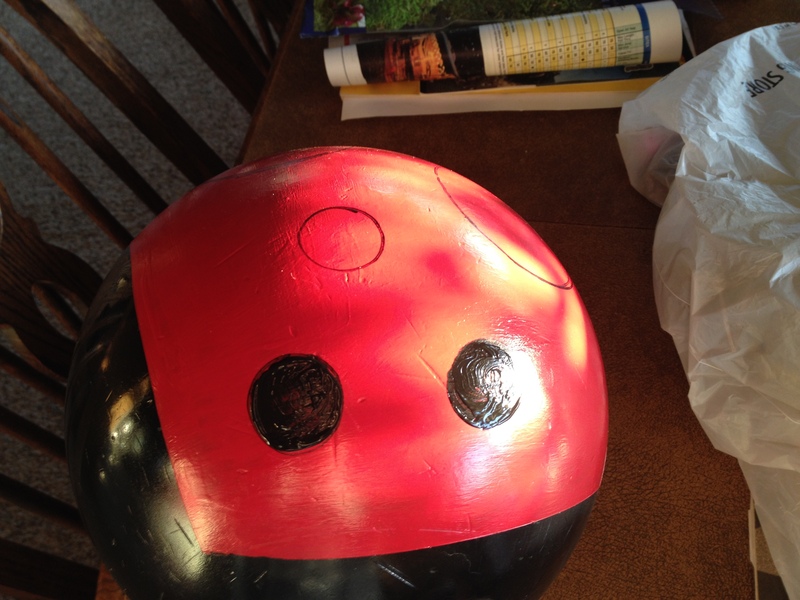 Since I planned to use the finger holes for his antenna, it was easy to place the tape between the holes and around the ball. Then I taped around the bottom about 1/4 of the way up to mark the area for his shell (wings). I also taped 1/4 of the way around the “face” area to stay black. Then I painted the red “wings” with a brush. 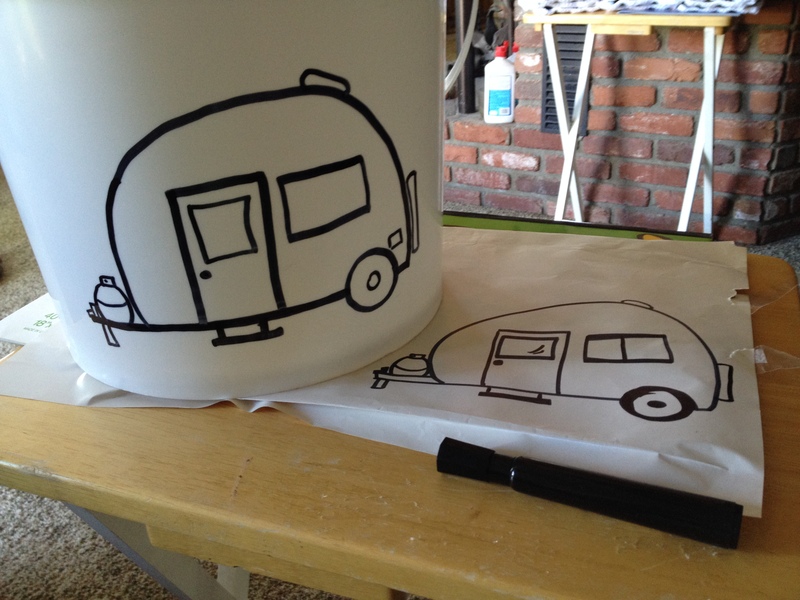 I used the roll of electrical tape to draw circles on either side, and the inside of the roll to mark the smaller dots. (Genius right?) 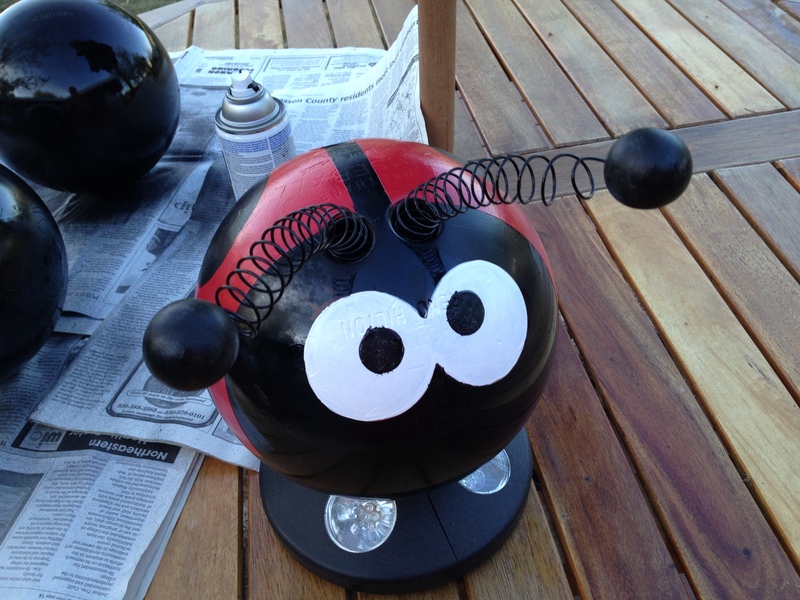 It did take a couple of coats of red to cover the black, then couple coats of black for the dots, but since it’s going to be in the weather and under the sprinklers, the thicker the paint the better. I placed the eyeballs slightly touching each other using the electrical tape to draw the circles and a silver sharpie (tough to see lines on black background) and did several coats of white letting it dry between each one. I used a penny to outline the pupils. Intentionally off set them so he looked kinda cartoonish. (Yep, that’s my style, funky). I found holding it in my lap worked best, between the weight and the fact you’re attempting to work on a round surface, it was a little harder to paint than I expected. Next I made his antenna out of the black wire. I just unrolled the package and cut it in half. I wrapped it around whatever was handy, in this case a hi liter. 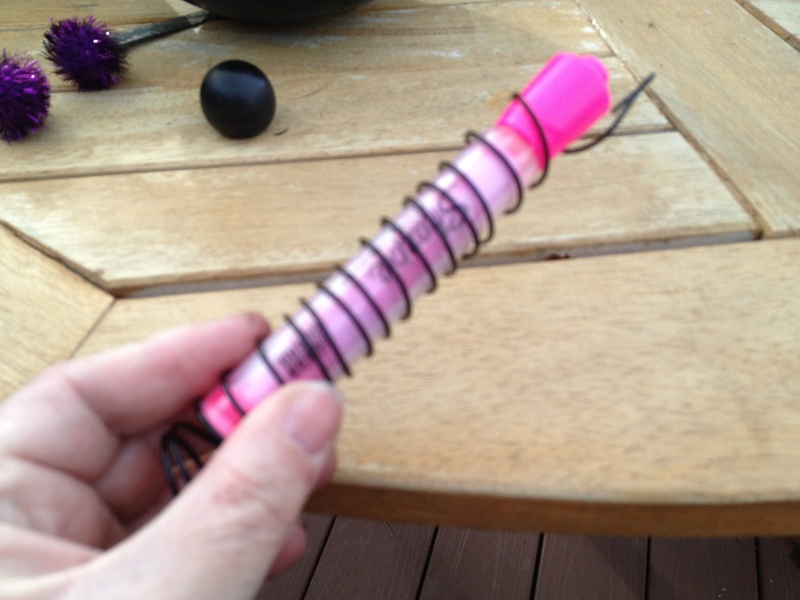 The size fit into the finger holes and I wanted a “springy” looking antenna. 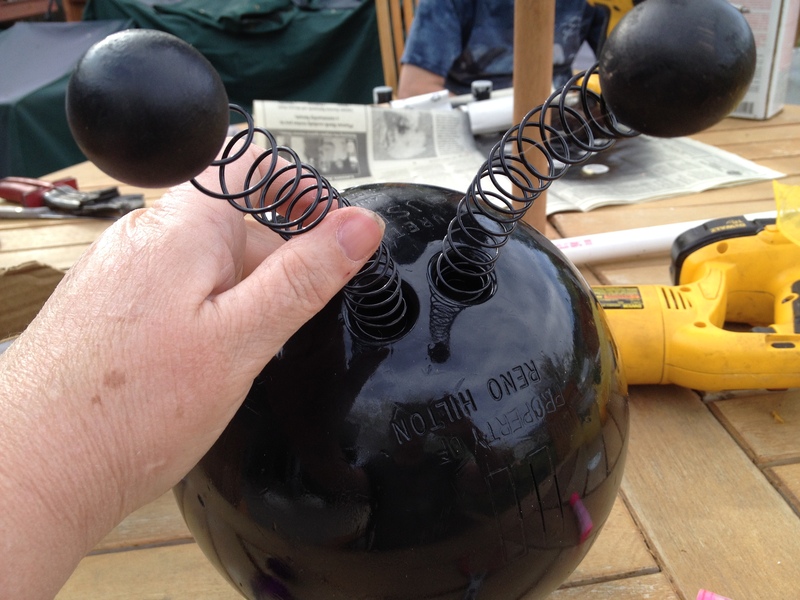 I painted the knobs (balls) black and inserted the wire into the holes on the bottom of them. then put them into the finger holes of the ball. 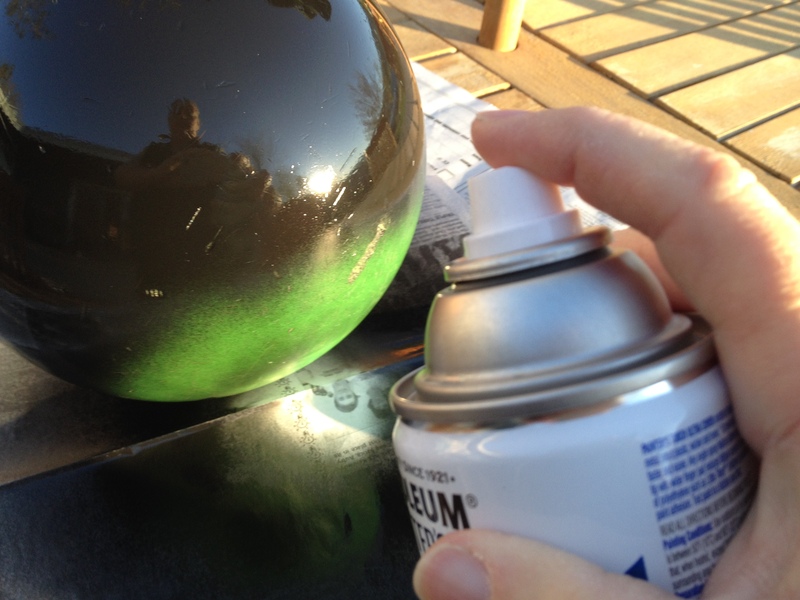 I did spray them with clear gloss sealer to help them last longer. Don’t know if this really works, but seemed like a good idea. Viola!! Ready for his new home!! Meet Giselle, she’s my muse. 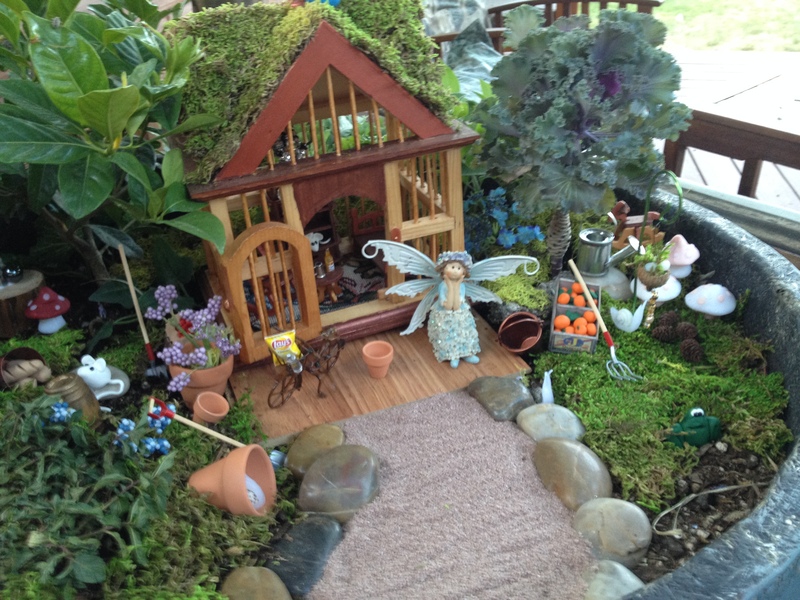 I’m currently obsessed with fairies and fairy gardens. She’s my inspiration for a looong blog about her home, and the future homes for her friends. Brace yourself, this is gonna be a long one, with more cuteness than you can stand. Lots of teeny tiny, pretty magical things. First let’s pick out her a home. Hmmmmm? 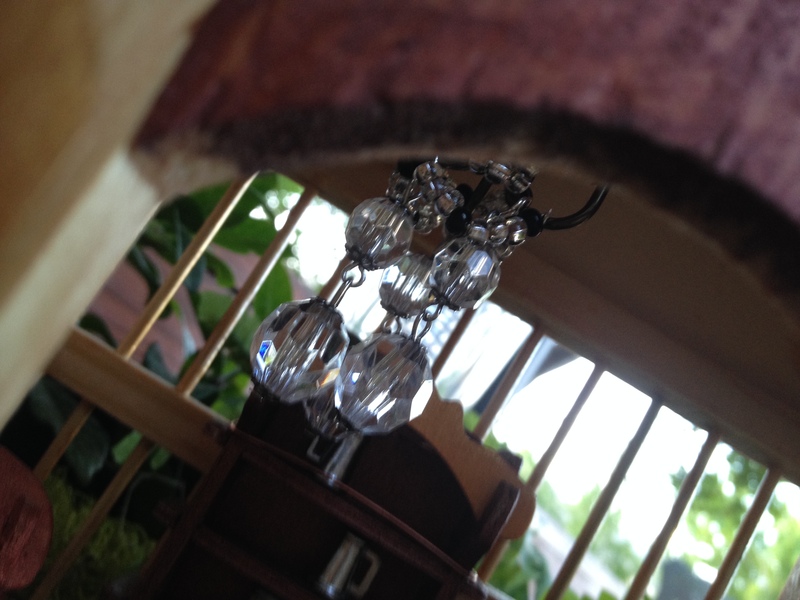 perhaps a pretty birdcage. Think she would be happy “caught” in a nice white Victorian style. Found this white wire one with a lovely crystal birdie on top at Michael’s, the top opens completely up making working inside easy. Since the bottom had a rather dense border around it, I decided to cut a cardboard circle the width of it to lift her “floor” up to the level of the open bars. This also gave me room to poke items through the bottom, and later the battery pack for something magical…. I’ve already been working on items for her place, including a table and some lovely wire chairs. 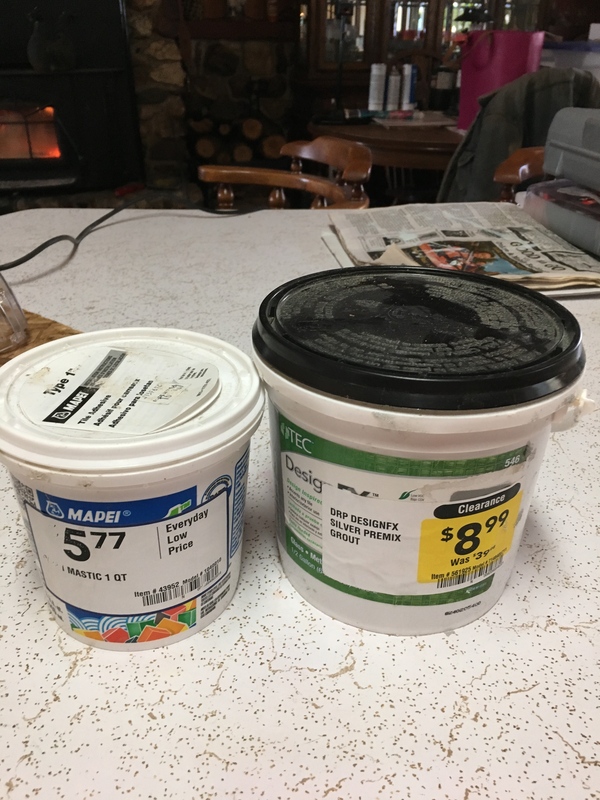 Purchased flower pots and a “pickle” barrel. I’ve been secretly collecting some decor items, as well as crafting items too. 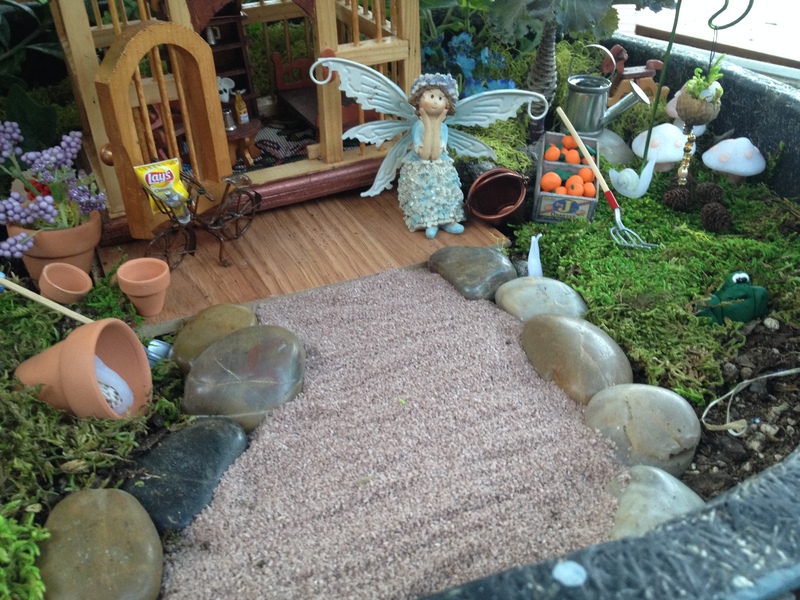 I laid them roughly out to figure out how big a patio and path I wanted on her “floor”. I applied some tacky glue with a paintbrush, and used decorative sand from the dollar store to create the path and patio. 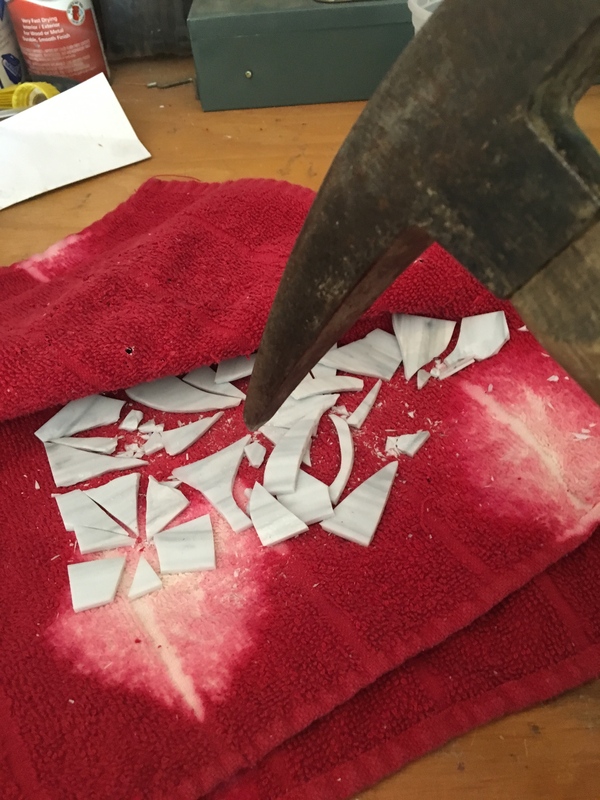 Probably could have used sandpaper if I had any, but this was just as easy. Next I added dried moss to the sides, and lined the path with tiny polished stones. 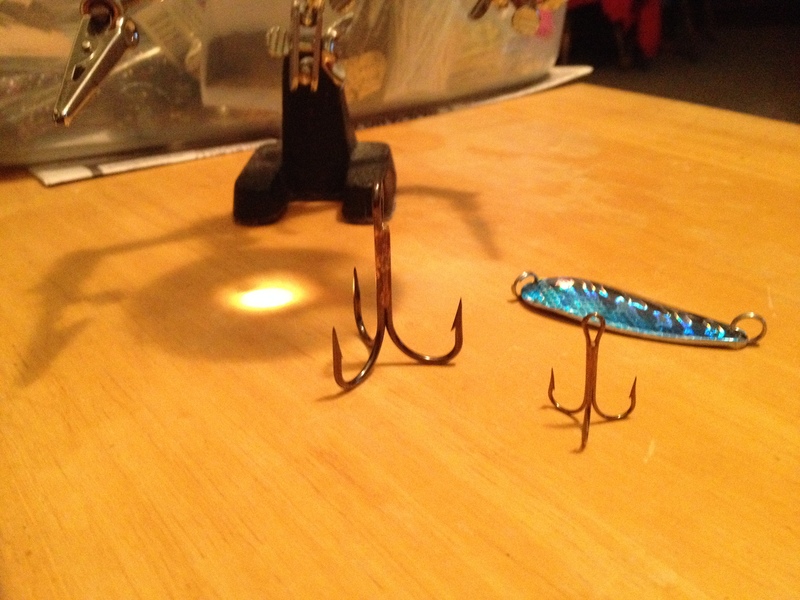 A wonderful friend of mine, makes tiny chairs out of wire. She did these two “peacock” style green wire chairs from a pin I had pinned for inspiration. She originally made the seats of moss, but they didn’t show up well in the space. I toyed with both a flattened acrylic stone, still too light and finally decided to “upholster” two large button covers with a micro rose print for the seat cushions. 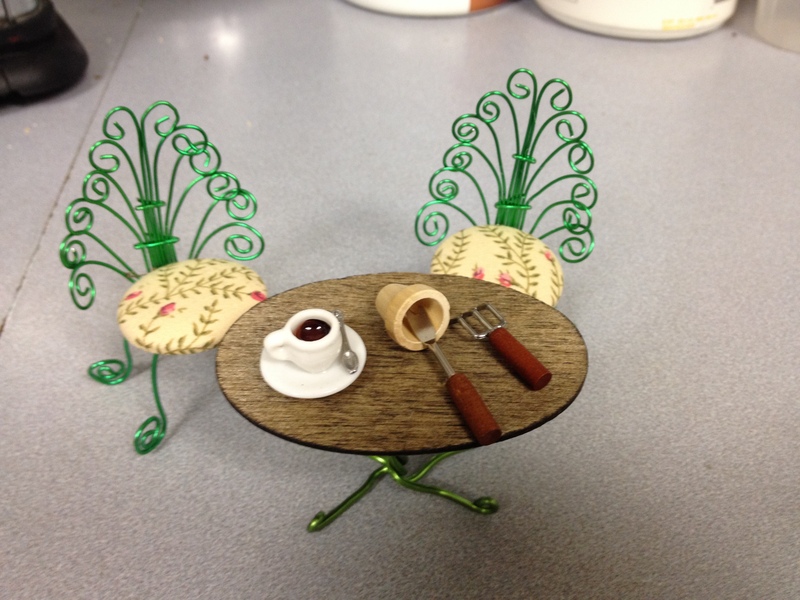 The table was crafted using 20 gauge wire table base, and an oval piece of balsa wood. 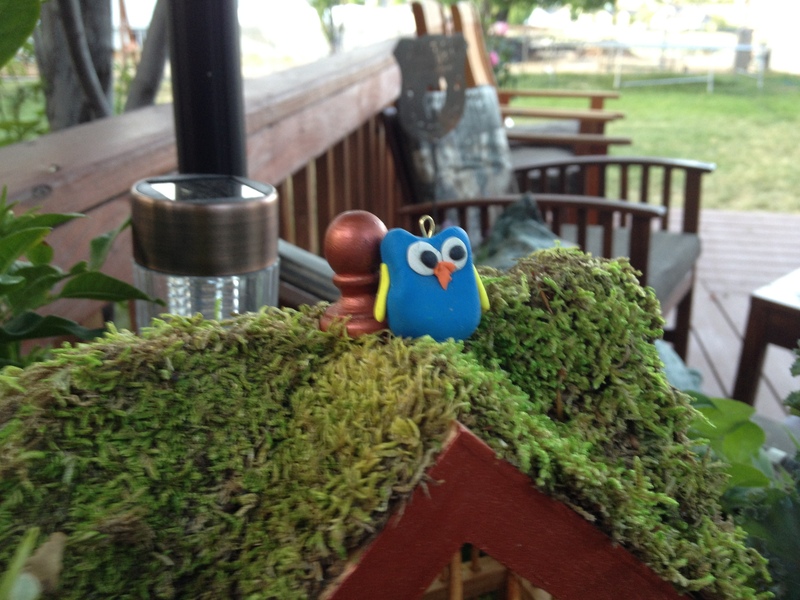 You could also make a nice one from a small slice of wood from a branch. Just watch your scale. 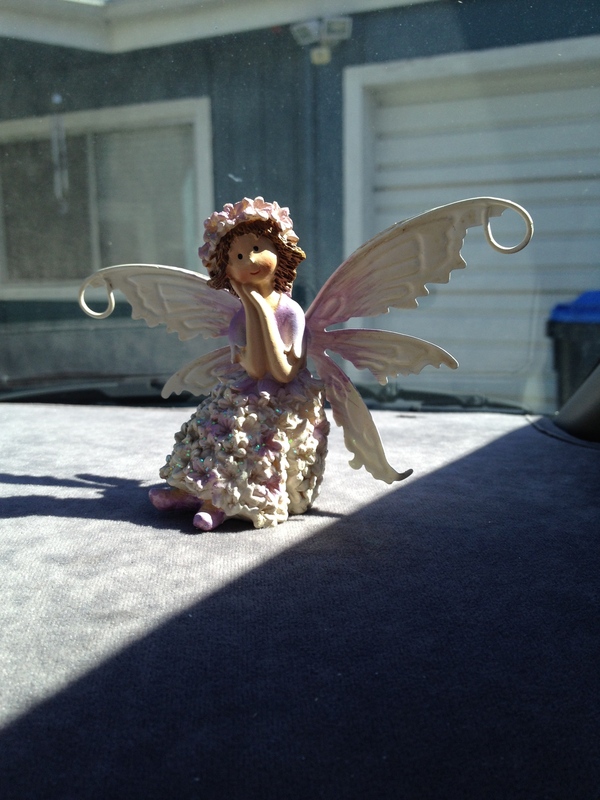 Since its early morning, I gave her a cup of coffee, some purchased gardening tools, and a teeny tiny pot to plant. You can glue these on or use miniature wax to stick them to the table. Thought she needed some “friends” so I took a few seashells, and a little “transparent” Fimo clay to create a bunch of snails to live with her. I made a slimy body with antenna, pushed the shell into the back, and baked according to package directions. So many great ideas on pinterest, saw this cutie. Wire shepherds hook, with a teeny tiny birds nest made out of an acorn top. 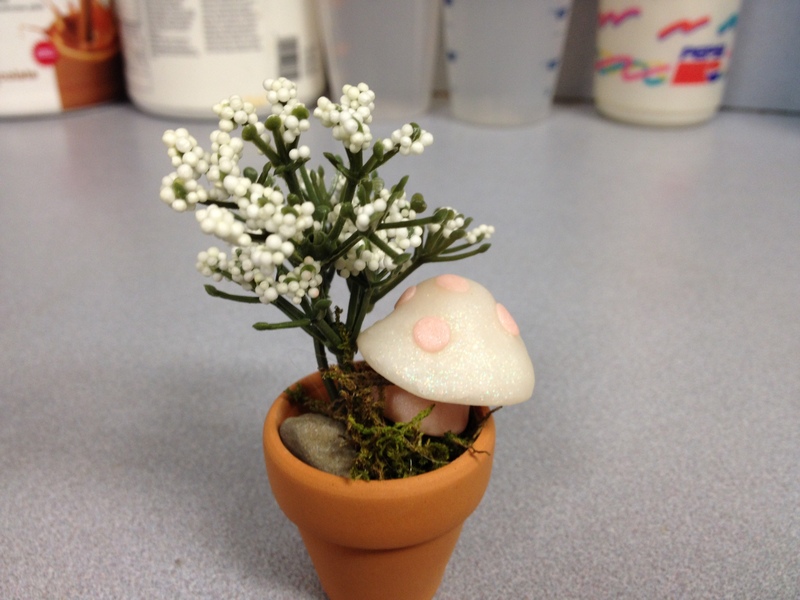 I got this, acorns, check, moss, check, teeny tiny eggs made with clay (baked with the snails) check…. How ’bout some mushrooms? of course! Just out of the oven as well, baked escargot, Mushrooms and eggs….Hubby thought I was talking about dinner. Imagine his surprise when he peeked in the oven! I put the mushrooms on toothpicks. that way I could poke them into the ground. 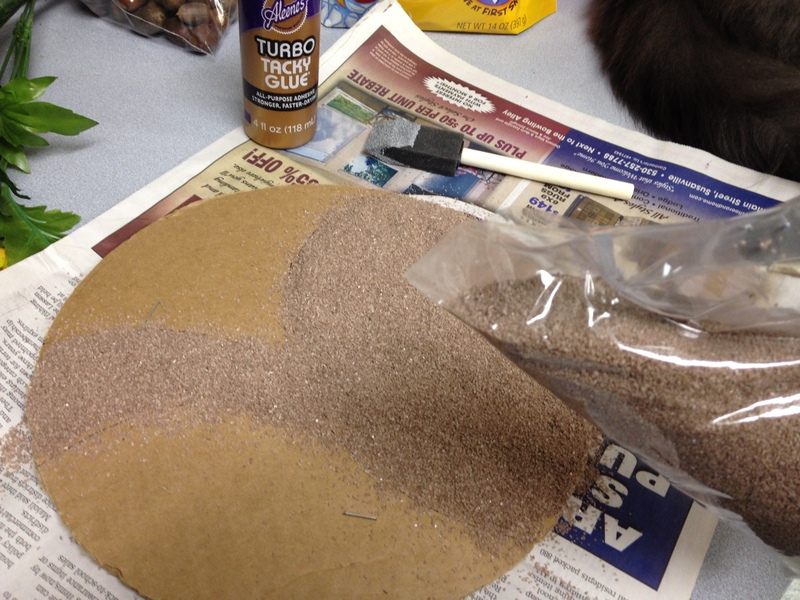 I have several red & white glitter clay, and pink and white marbled. (In already planning a second outdoor home). 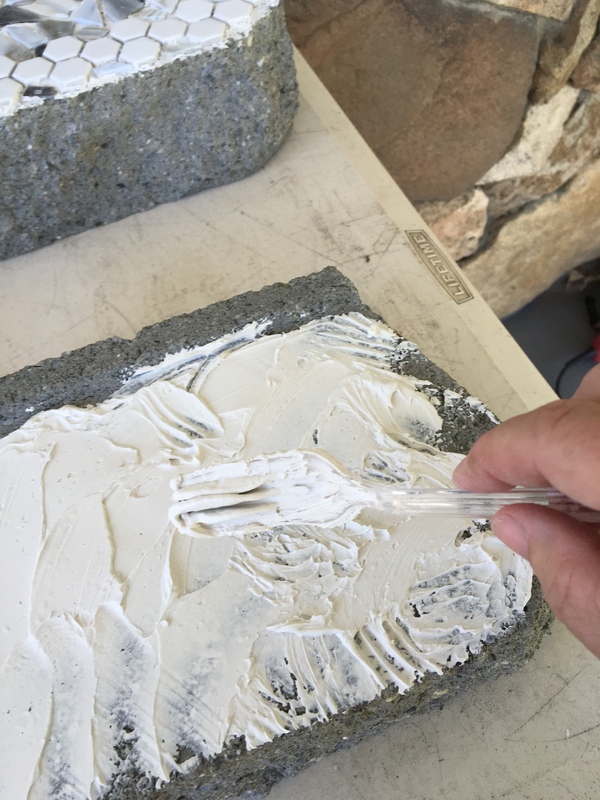 Golf tee plus marble…equals gazing ball! Mushroom, rocks and moss…. Final touch, lights!! 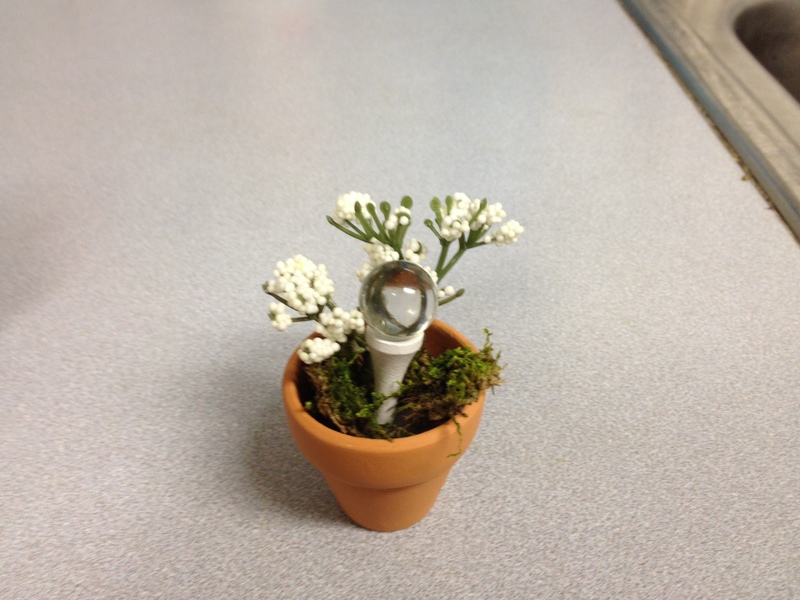 set of 20 super tiny battery-powered lights! Magical!!! Pushed up from the bottom, batteries not included, but worth the last-minute revamp of her floor. 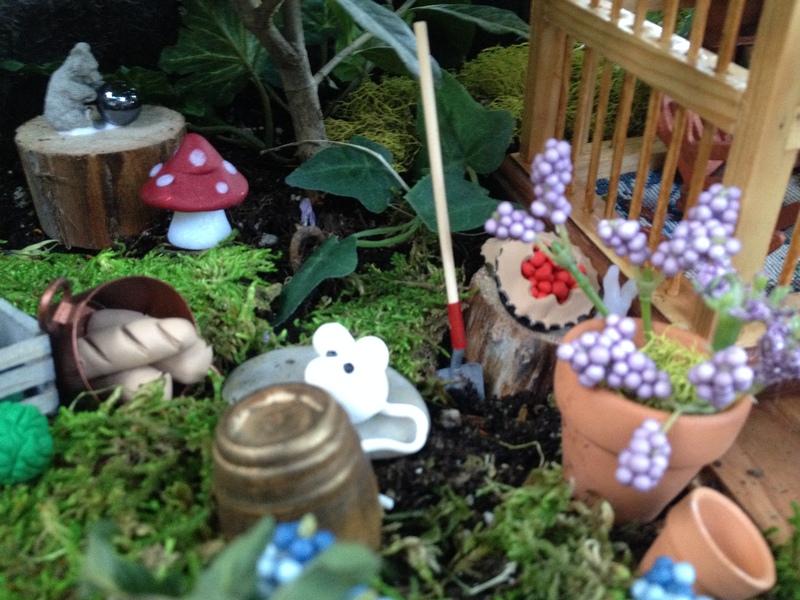 You can find some fabulous miniatures online, and the craft stores and some garden centers are now carrying many super cute items for fairy gardens, but follow my motto: don’t buy what you can make! She has a friend waiting for an outdoor home. I have a leaky bird bath perfect for her future home. This is going to be a group craft with my friends, so well post as soon as we get them done! Cooling bandanas are super easy to make. 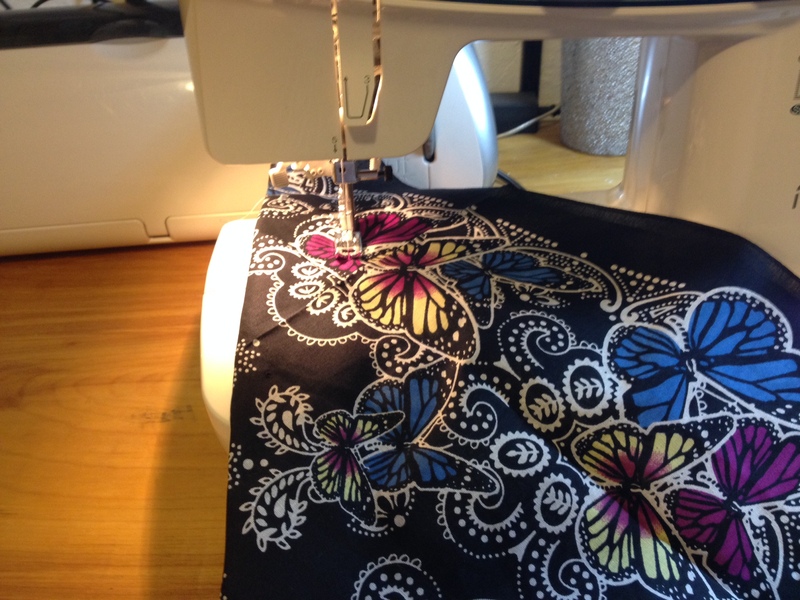 If you can sew a straight or almost straight line you can do it! It might be snowing outside today, but summer will be here soon enough and you want to be ready. I found my bandanas for a dollar each, and since you only need 1-1 1/2 tsp. 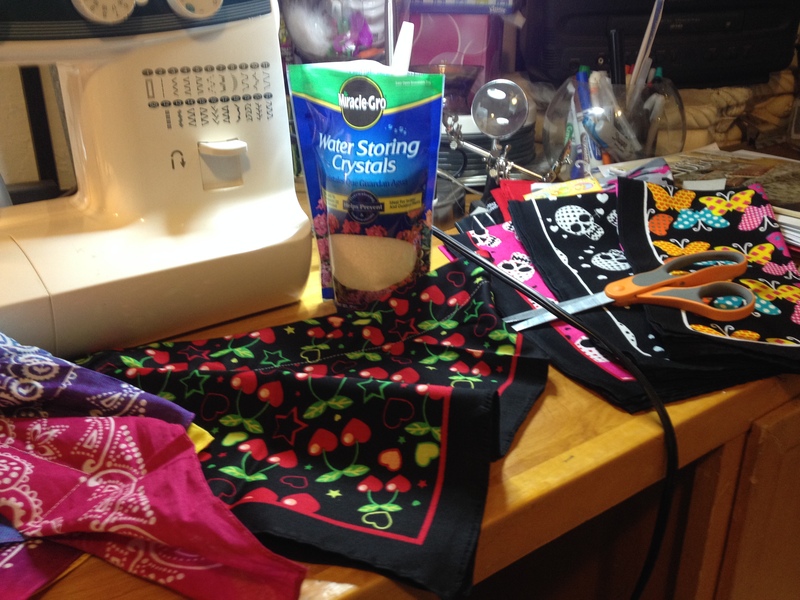 crystals per bandana, these are super budget friendly. I’ve seen these sold at summer fairs for up to ten bucks each. But, on a hot day in August at the rib cook off, I almost paid it to cool off! 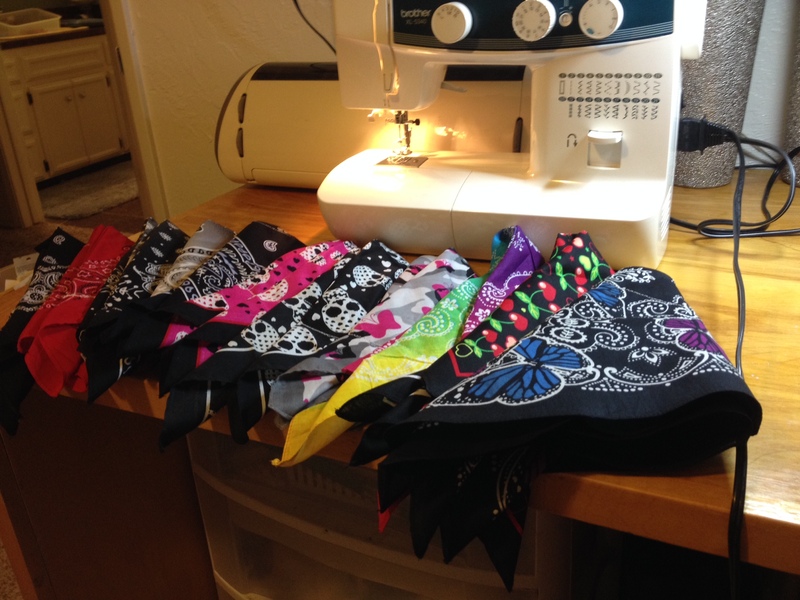 Start by folding your bandana in half crosswise. Right sides facing each other. Mark a spot 6 inches back from each point. This is where you will make the casing for the crystals. I used a pin on each end to mark. 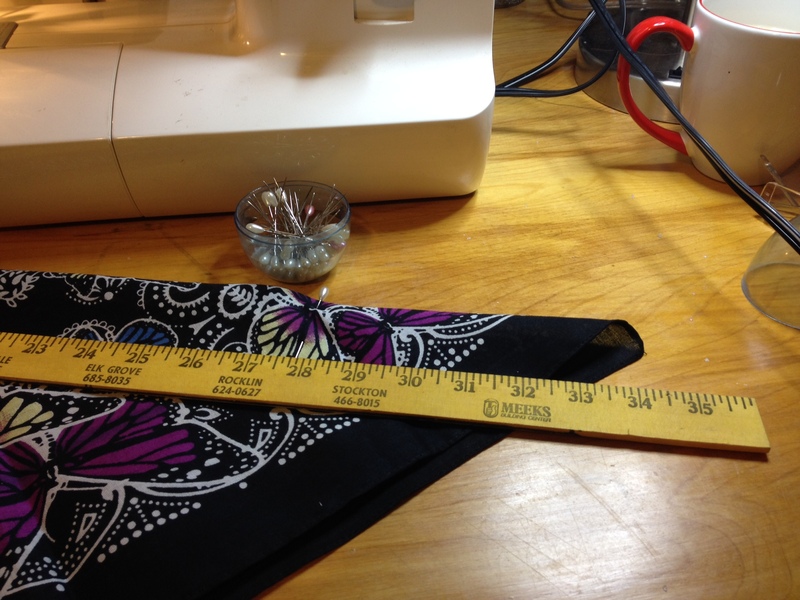 You want to sew from the folded side down 1 1/2 inches from the edge, stop with your needle down in the fabric. 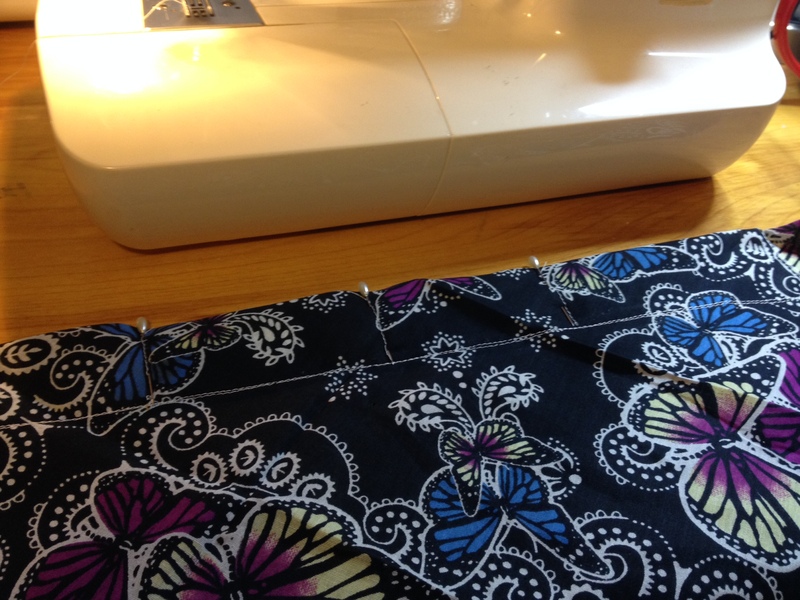 Lift the pressure foot and turn the fabric to sew along the long side. Sew down to your second mark but don’t turn. You need to leave this open to put in the crystals. Remove from your machine, and clip your threads. You’ve just made a pocket (tube) to hold the “magic” crystals. Use a measuring spoon to scoop 1/4- 1/2 tsp. of crystals and pour into the opening you just created. Be sure to keep the crystals away from children and pets, they’re highly toxic! Shake them down to the end of the tube. I suggest you split up this tube into four sections so all the crystals don’t bunch into one clump. 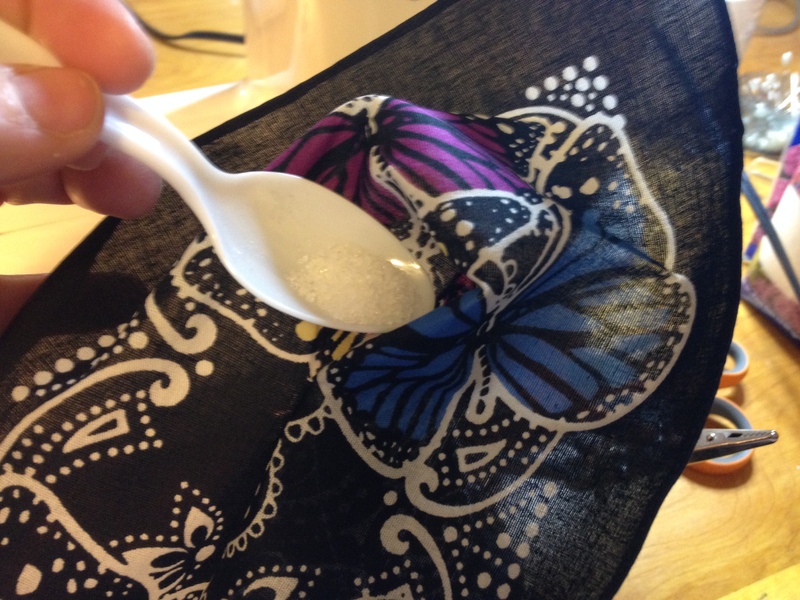 Sew a line across the pocket about 3-4 inches from the end to keep those crystals there. Repeat this 3 more times for a total of four pockets. They only need to be measured if your OCD is acting up, otherwise just eyeball it. When you close the final pocket, double stitch it, and continue down the long side and finish a double line at the other end. Now flip the bandana open, right sides out, crystal pockets inside, and stitch along the edge of the pockets over again. This puts a double layer of fabric over the crystals, and hides any boo boos. 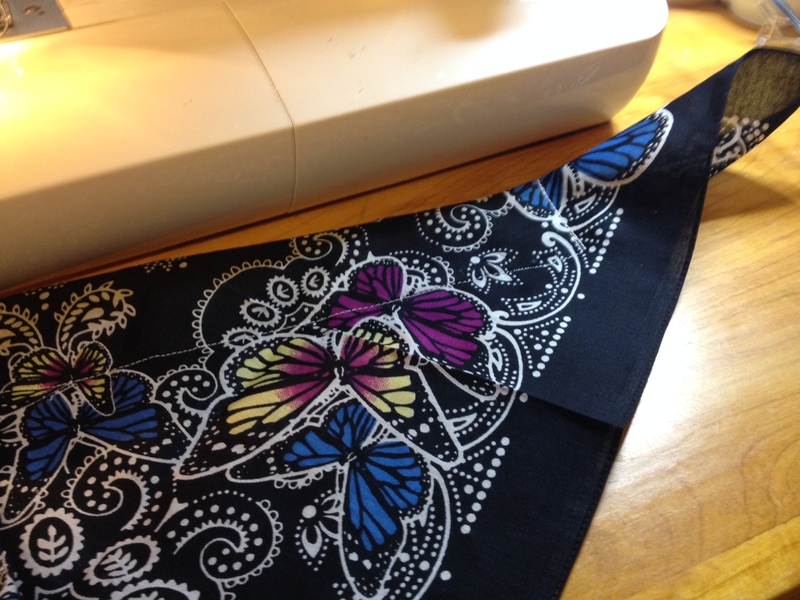 You can get fancy with your sewing machine and use a decorative top stitch. I was working on quantity, so plain straight stitch for these. 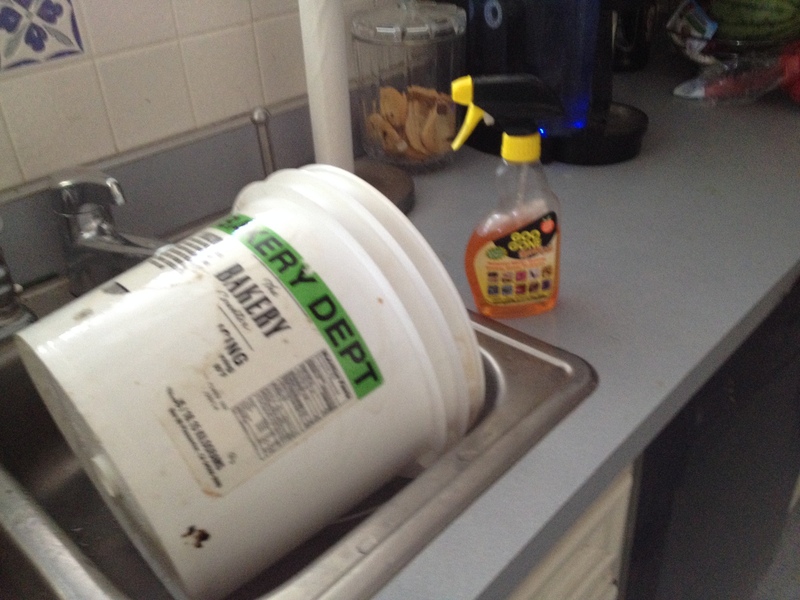 To use them, just soak in cold water 2-3 hours (try it overnight in the fridge). They can be stored wet in a ziplock bag, or let them dry out completely when not in use. Good to keep a couple in your vehicle or RV. Great for hiking, biking or anytime the heat is on!